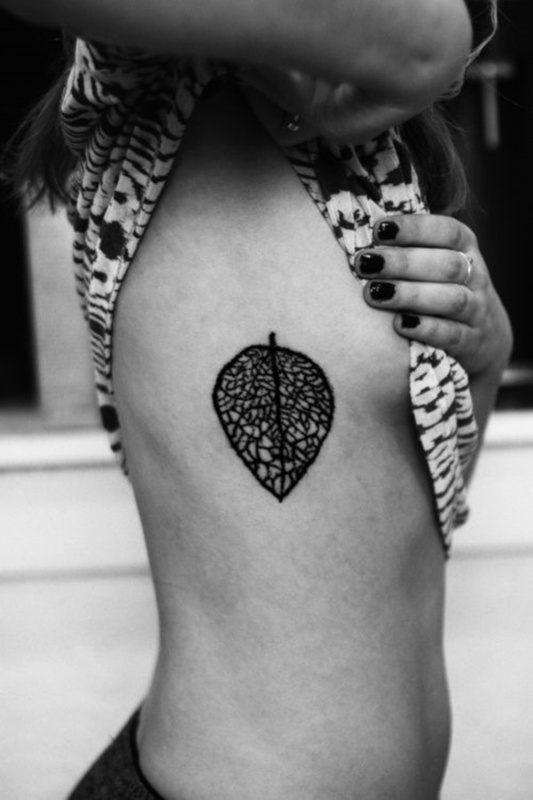 Leaf tattoos are incredibly popular all over the world and come in a wide variety of shapes, sizes, designs, and types. 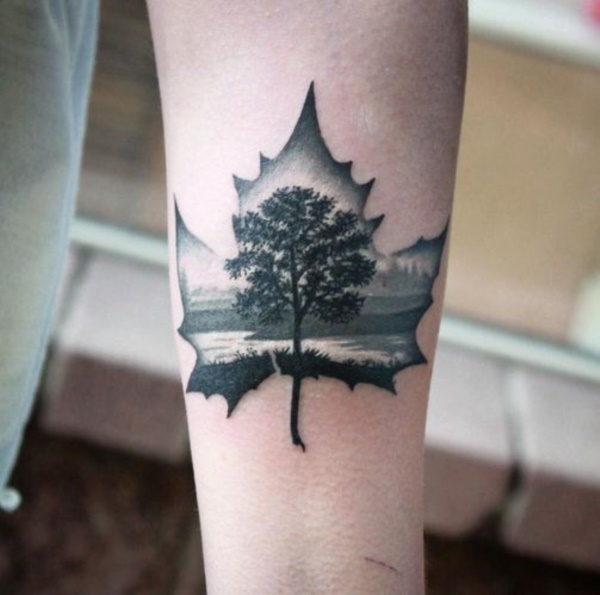 While each person will have a different reason for getting the leaf tattoo they have chosen, there are a few symbolic reasons that people have made the decision to obtain a leaf tattoo. These reasons range from religious reasons to representation of their nationality, and even as a symbol of changes in the person’s life or the cycles of life. 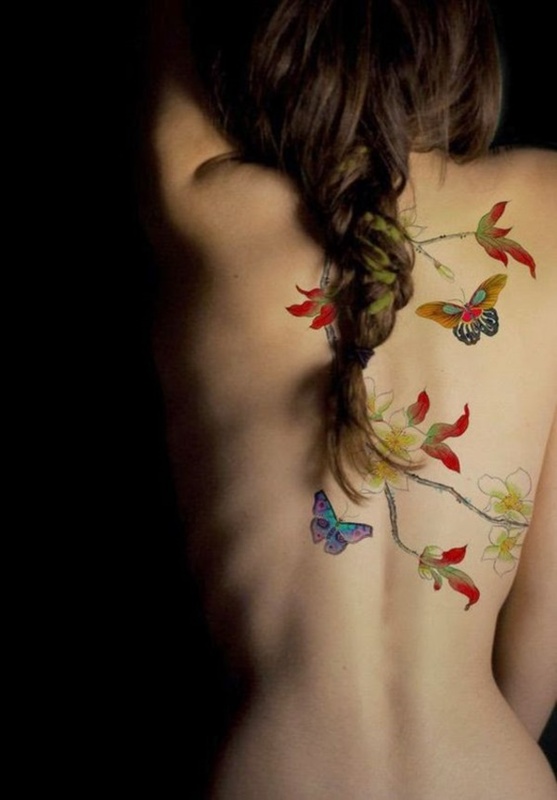 Although each person will have a reason of their own even if they don’t fall into these specific reasons, these tattoos are both beautiful and simple in their own way. 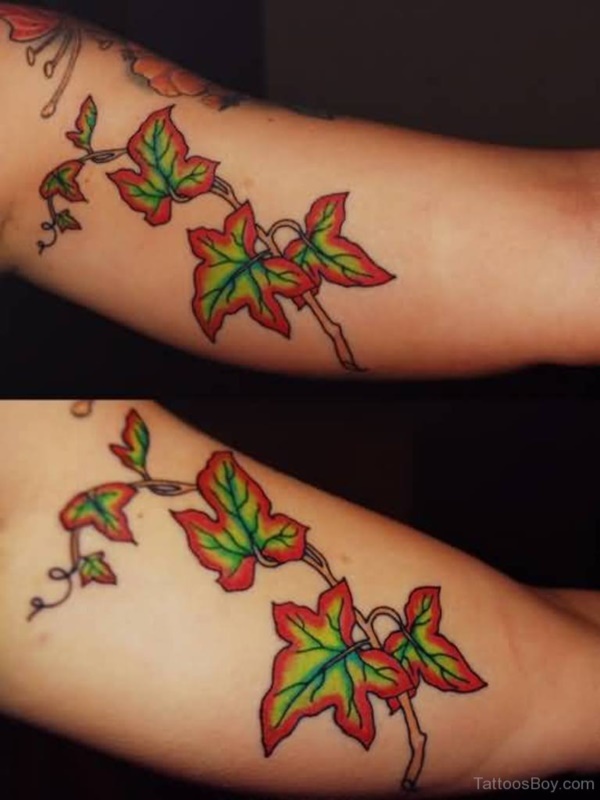 Vines, as well as fruit and berry plants, are a frequently chosen option when looking for simplistic leaf tattoos as they look great whether they are in color or black and gray. Leaves that are still on the vine are another wonderful choice and can possess a great deal of character no matter how simple the design. 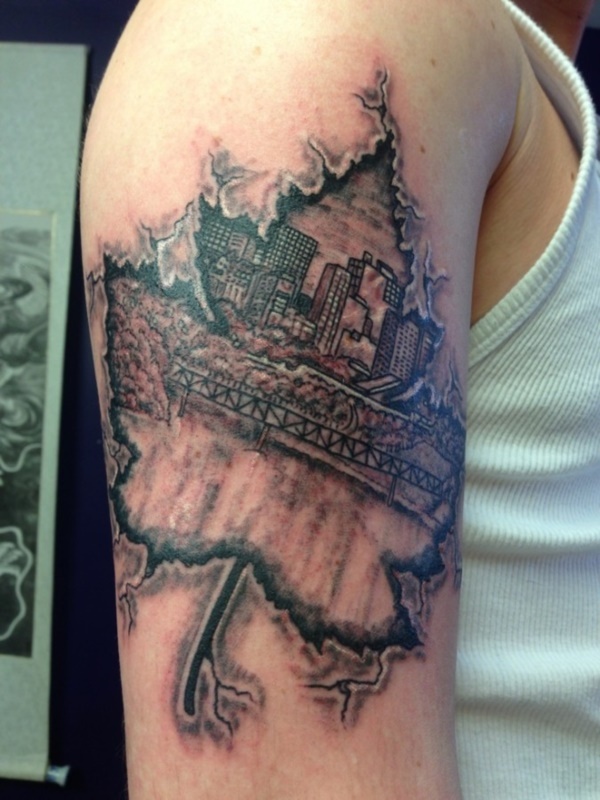 This tattoo is the perfect example of city pride since it could easily be guessed that the tattoo represents a favorite city and a specific place in that city that wearer loves. 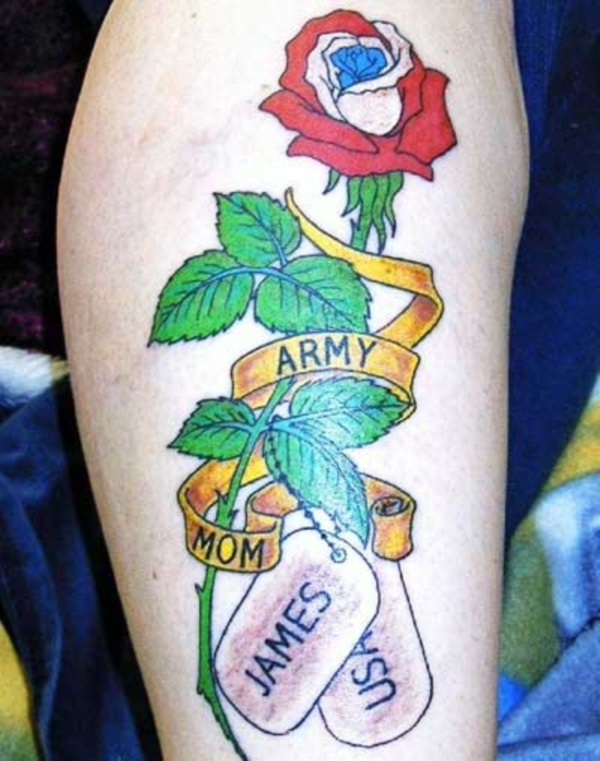 Tattoos done in a memorandum of a loved one frequently possess leaves since most people get tattoos of flowers or trees like the tattoo below. Browned leaves can be an easy way to depict the life cycle that leaves go through between spring and fall as they fall from the trees before coming back in the spring. These gorgeous red leaves drifting to the ground from the tree is a beautiful depiction of the beauty of fall with its amazing show of colors. The creative way that the leave contains the image of a predatory bird hunting for its prey is another amazing symbol of the circle of life within a leaf design. 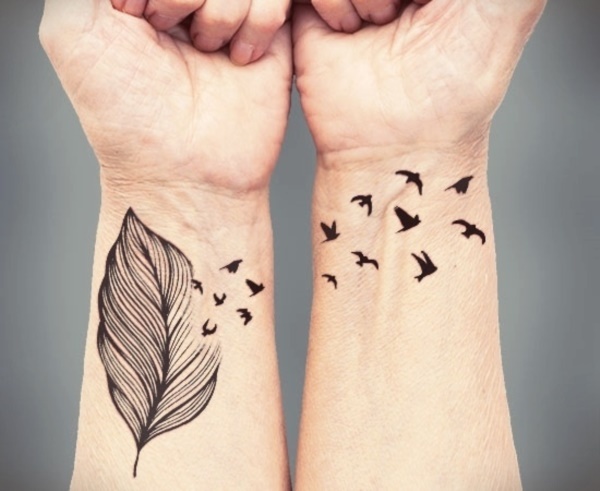 This leaf shaped feather bursting into a flock of birds is another wonderful idea for someone who loves nature and the many wonders it holds. 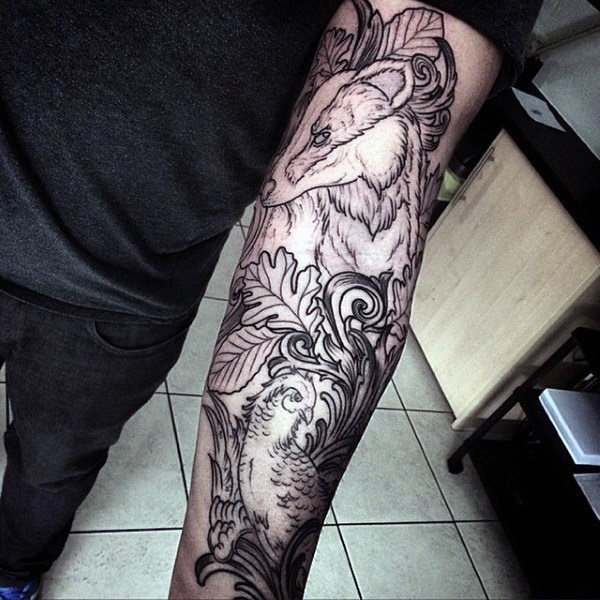 Occasionally you will find some tattoos that possess a wide variety of different leaves within a single work of art like the image below which also features various animals as well. 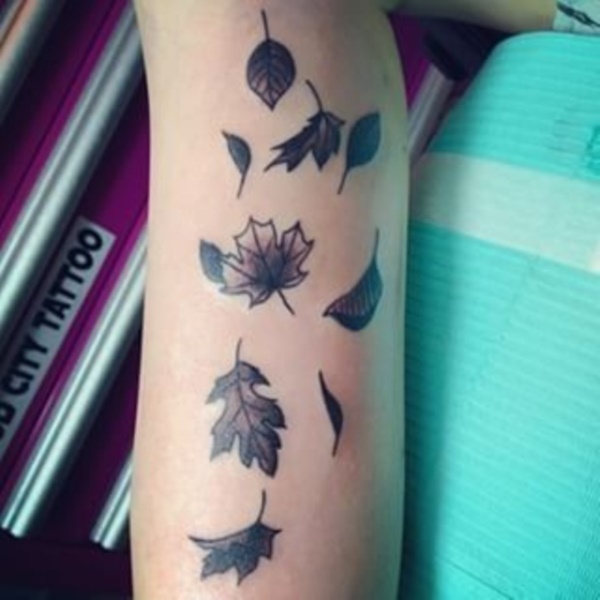 If you cannot choose a favorite type of leaf to have tattooed, you can always choose multiple types of leaves that can appear to be drifting to the ground. 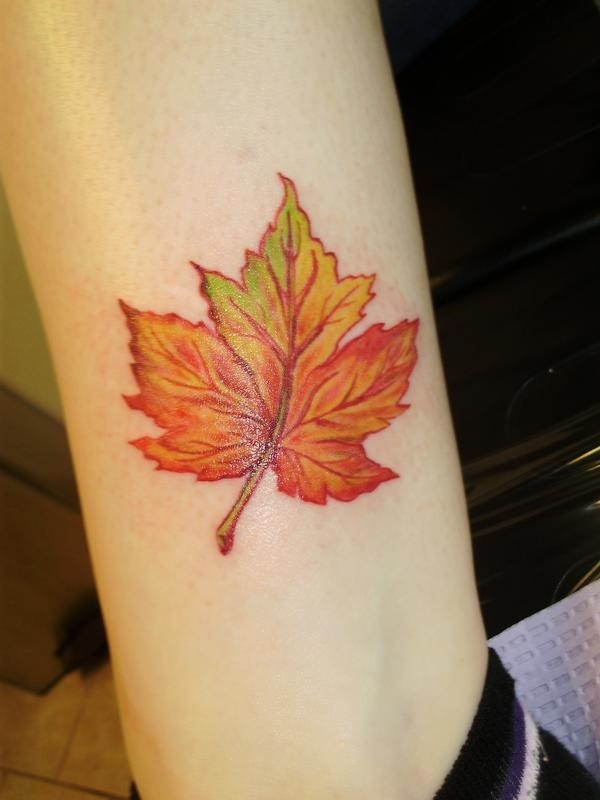 Maple leaves tend to turn a beautiful red color that will turn a golden color after falling to the ground and having this leaf tattooed can truly show your love of fall and the beautiful trees. 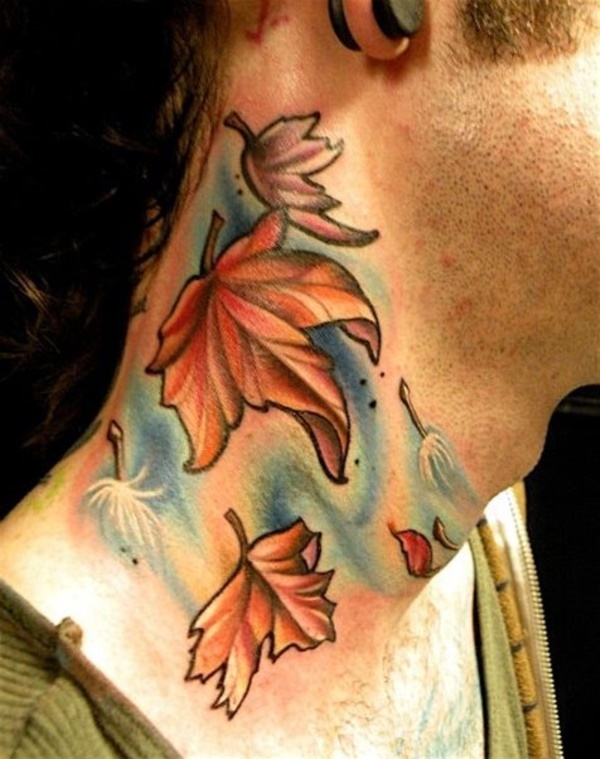 Just because you get a leaf tattoo to showcase your love of nature doesn’t mean you cannot be creative like this multicolored leaf design. 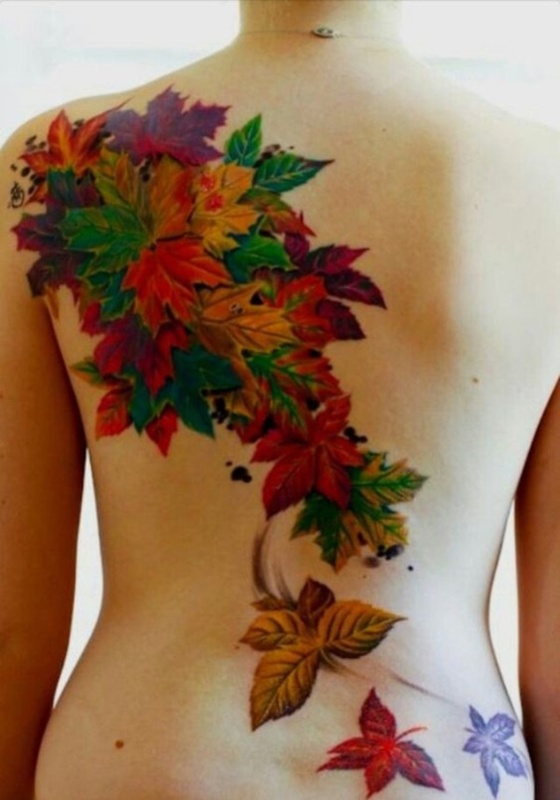 Some of the prettiest leaf tattoos will feature multiple leaves on a branch as a number of colors can brighten the overall image creating a beautiful tattoo. Shattered leaves aren’t as common as the more colorful variety, however, these kinds of shattered, geometric designs are beautiful while remaining simple. 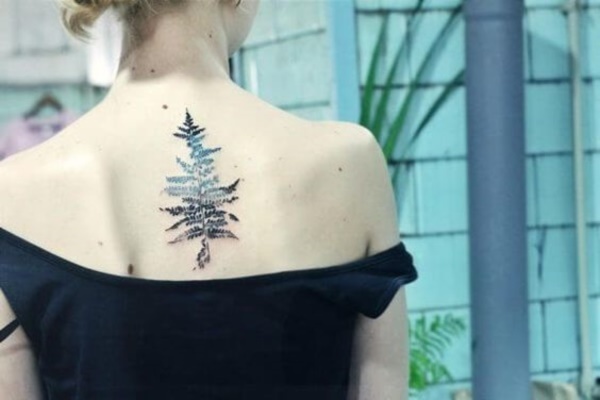 Fern leaves are another amazing option for those who are looking to share their love for nature while keeping a simple design. 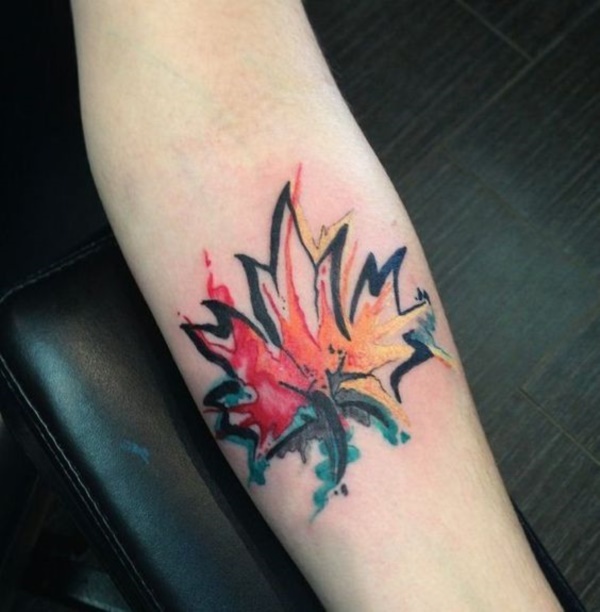 When considering your design for your own leaf tattoos you can also choose to have a watercolor type color design to your tattoo to allow it to stand out while also being more unique. 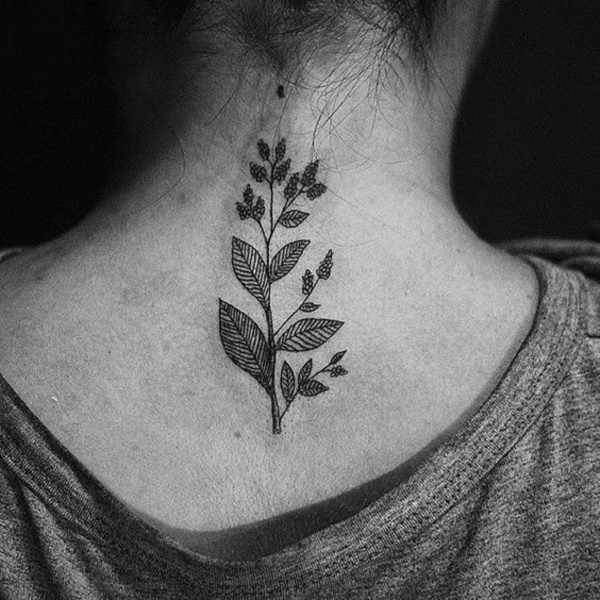 If you want something a little more delicate you can combine your leaf tattoo with other elements to soften the design such as adding butterflied and blossoms for a more feminine appearance. 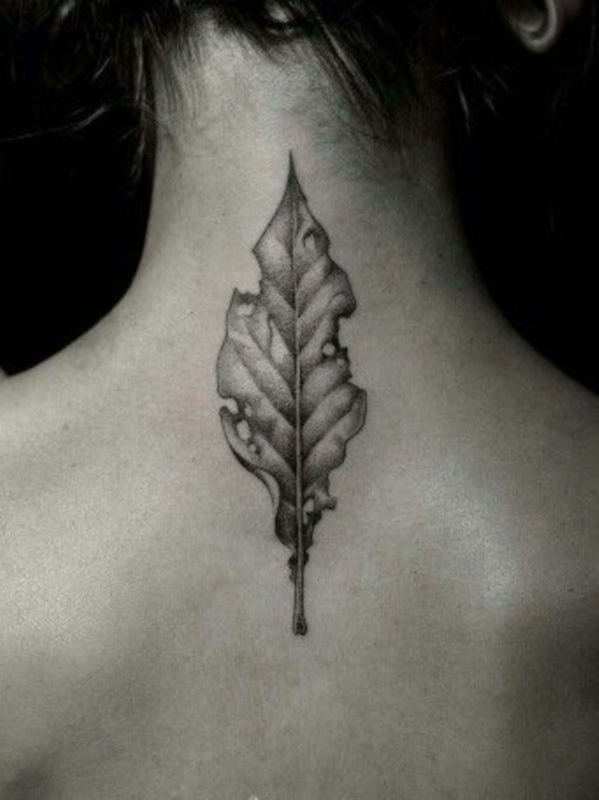 Some tattoos simply look better in black and white instead of in color, like the leaf tattoo below the elegance of the design in black and white would be ruined if it were in color. 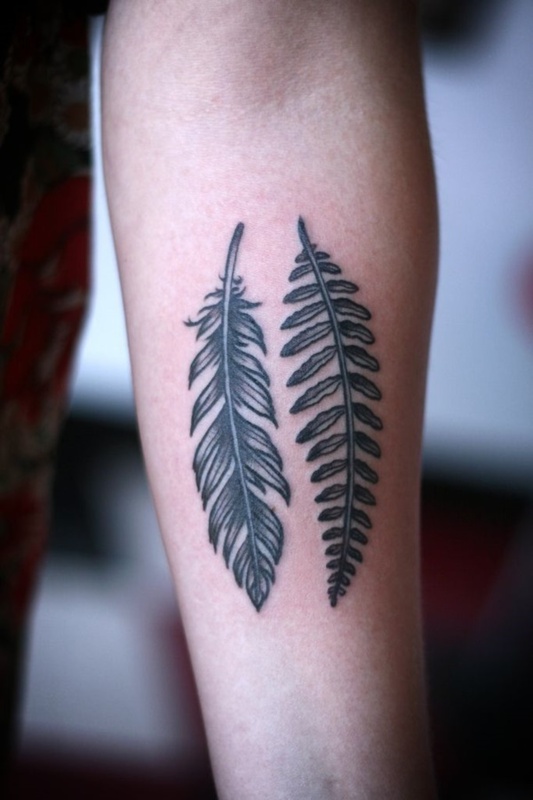 The similar shape that the fern leaf and feather share creates an interesting tattoo that definitely compliments nature in every way. 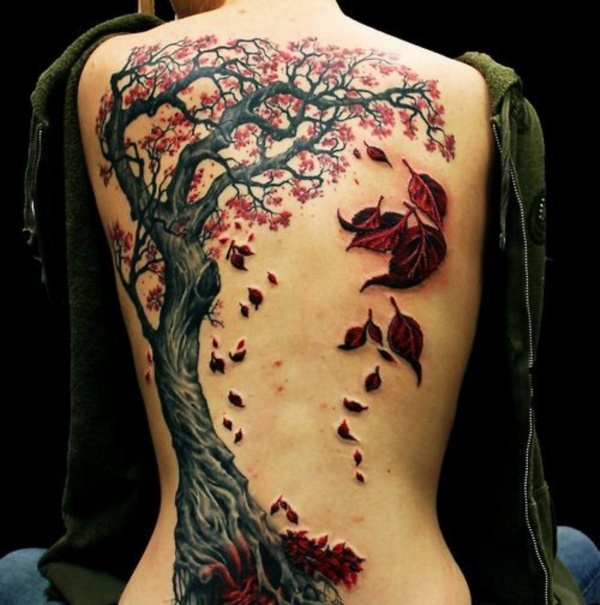 This tattoo can certainly depict a wide array of different things from the cycle of life to the deforestation of trees. 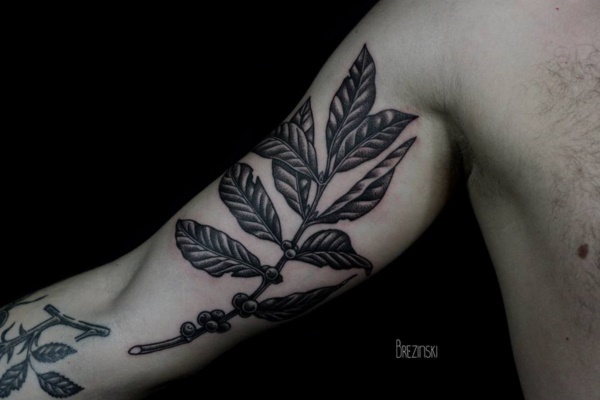 It can only be guessed that this tattoo is that of a blueberry bush but due to the black and white design it is difficult to tell, although the location of this tattoo compliments the curve of the arm. 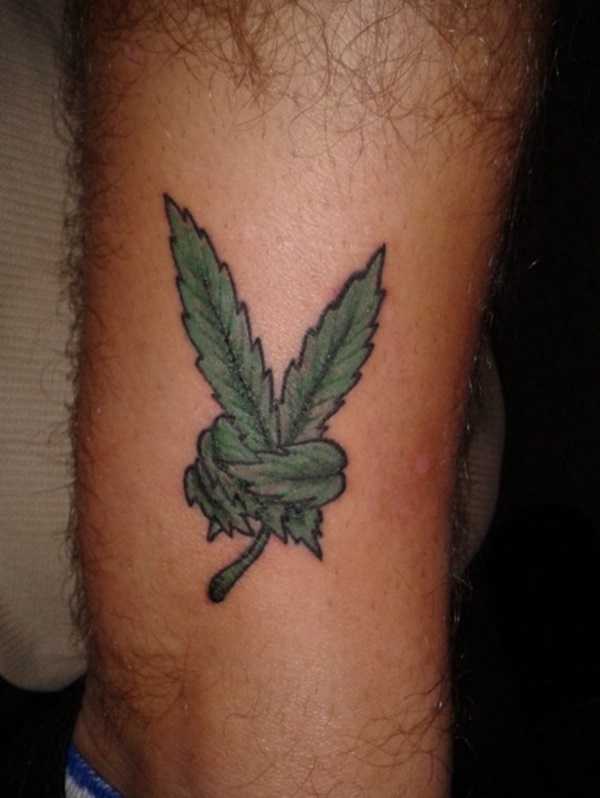 Known by a plethora of different names, marijuana leaf tattoos are incredibly popular for a wide variety of reasons and can be worn by a variety of different people. 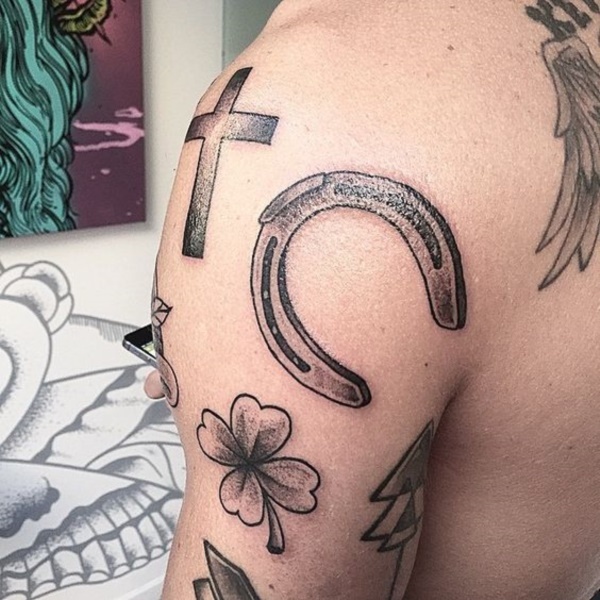 While blacking out the background of a tattoo is becoming a popular way to cover unwanted tattoos, it is also allowing for artists to make their work stand out even more against the skin. 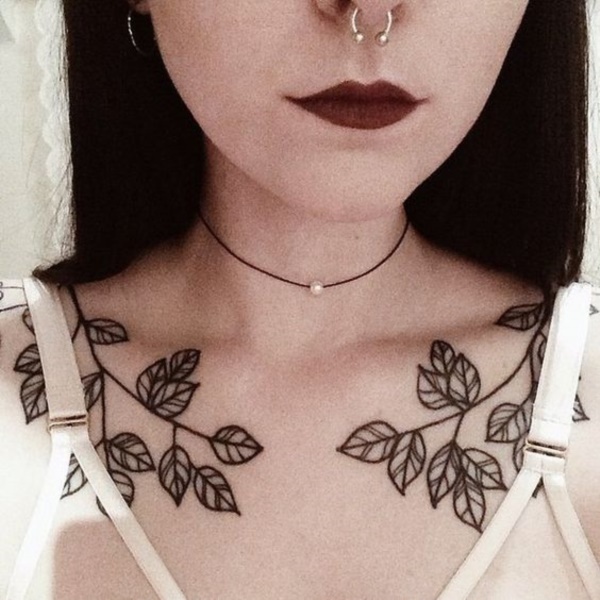 Some leaf designs possess a rich pattern, or patterns, to show off the wearer’s passion for the work of art that they are wearing and encourage it to be more unique than that of a simple leaf. 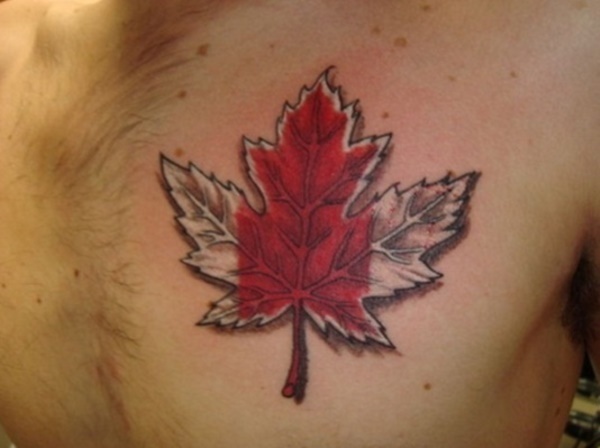 While some tattoos will possess hidden images, other are far more straight forward such as this eye within the center of the maple leaf. There are some strains of marijuana that possess different colors in their leaves, and some people will obtain their favorite kind of leaf. 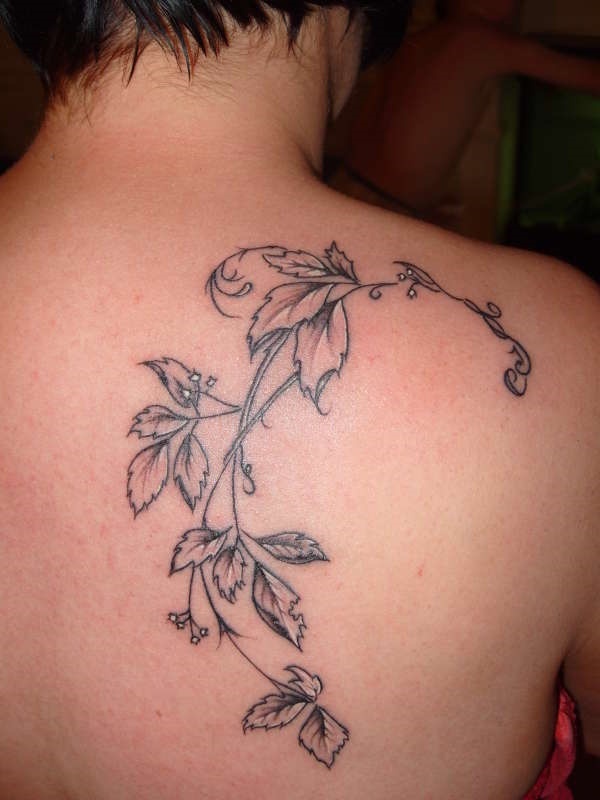 Another delicate leaf design idea is to obtain a small vine design that will provide you with the ability to be creative and enhance the shape of the area you want it to be. 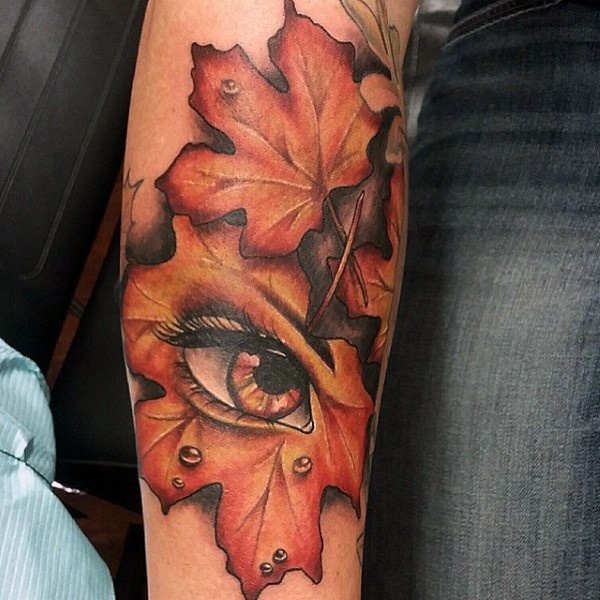 As you can see, this tattoo also features an eye among the leaves, however, the color of the leaves compliment the color of the eye to allow both the eye and leaves to stand out. Since there are a wide variety of different vines to choose from you can ultimately get them in many different colors such as these red and green leaves. 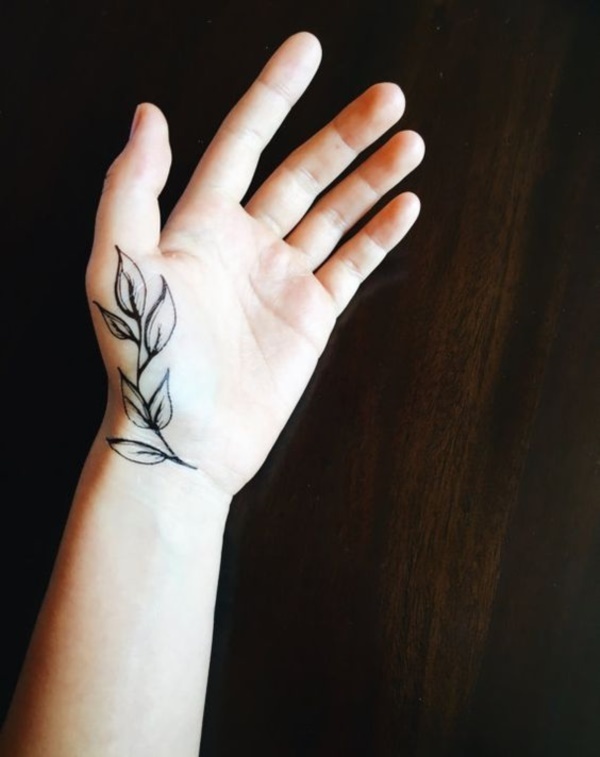 Leaf tattoos come in many different sizes and shapes which can also provide you with a plethora of choices and can be combined with shapes and symbols for different meanings. 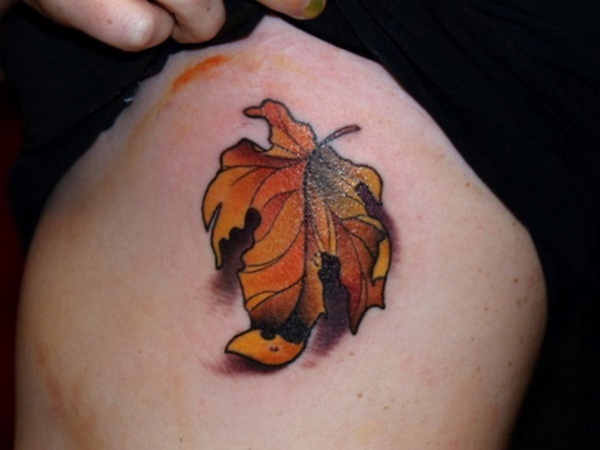 You will find that leaf tattoos come in many sizes from very small to incredibly large. 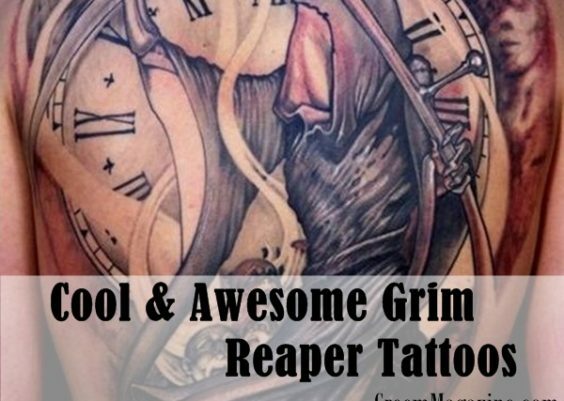 Choosing the size of your tattoo will depend on how committed you are to the tattoo you want. 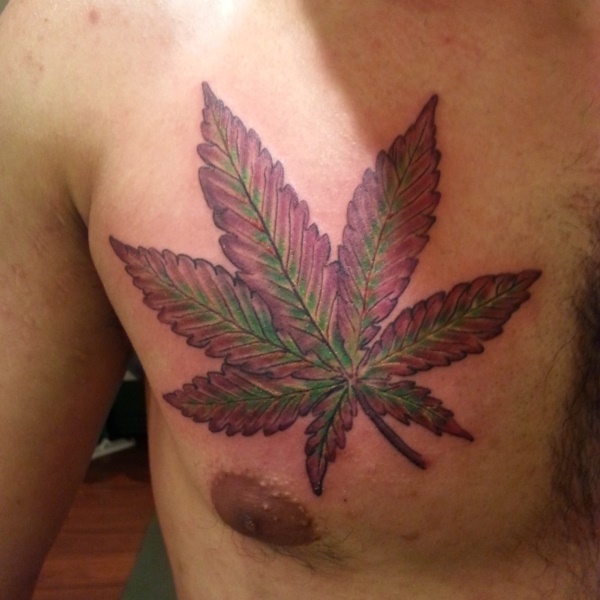 Some leaves can be completely filled in with a solid color like this marijuana leaf tattoo which has been filled in with a black ink leaving the veins of the leaf unfilled. 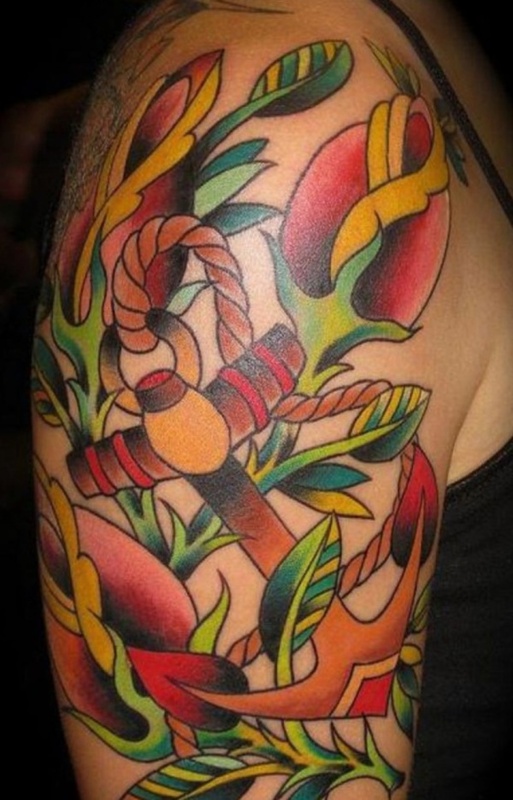 Adding in another element to your leaf tattoos can create a more interesting concept such as this anchor and rose tattoo. 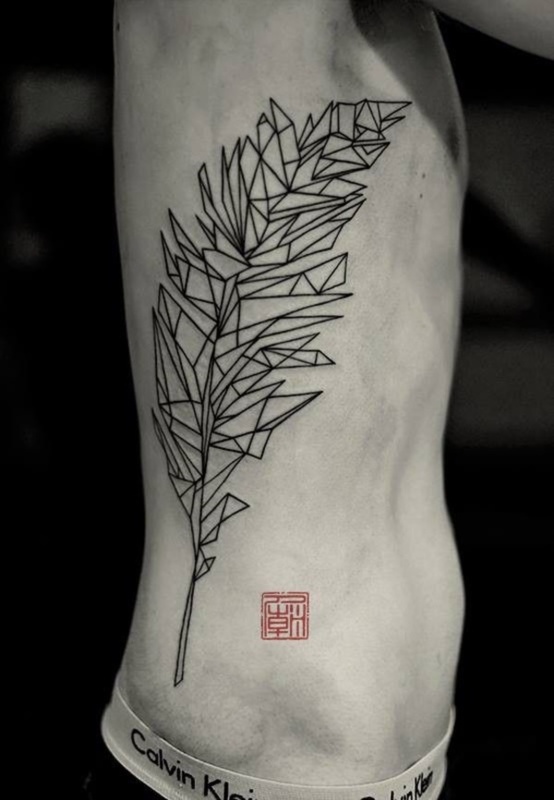 Fern tattoos can be done in a variety of different ways such as this half-filled half outlined style that looks as though the leaves were cut from the blacked out section. 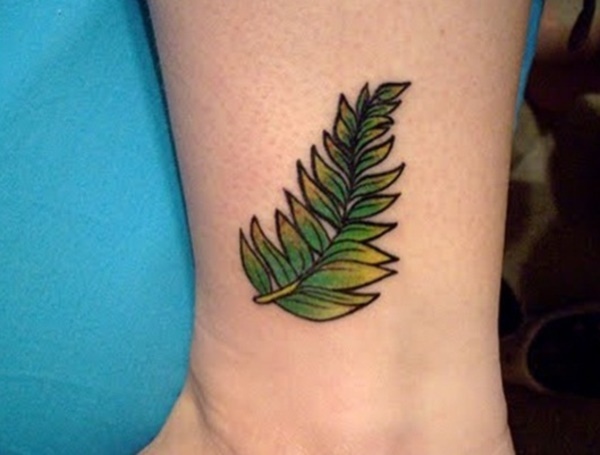 Even filled and shaded color tattoos can be simple in their appearance such as this fern tattoo that possesses yellows and greens within the black outline. 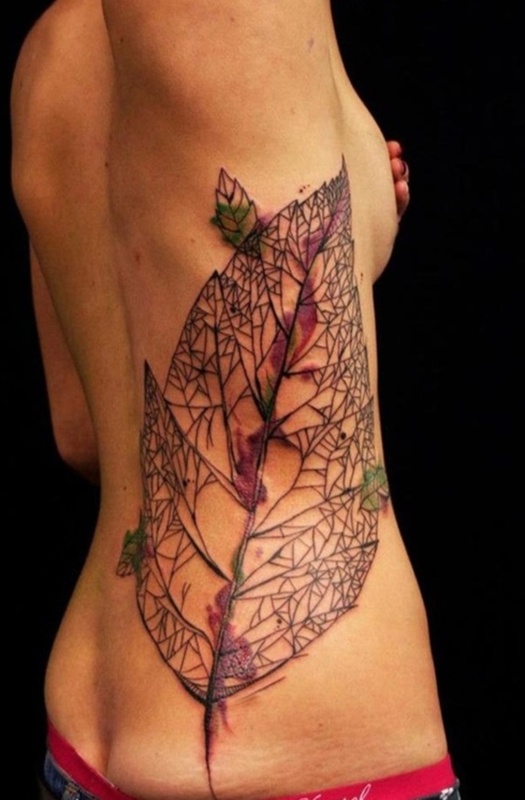 You can also add an element to connect the leaves in your tattoo to create a unique design such as the ribbon connecting the fall colored leaves. 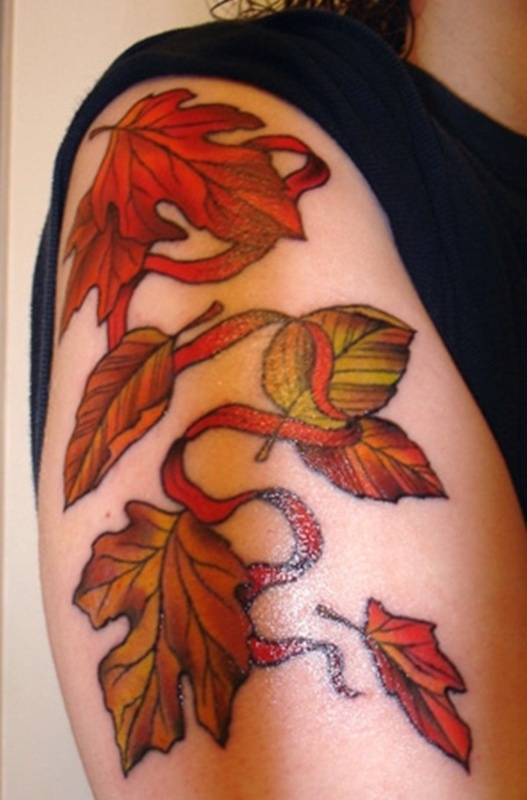 Another gorgeous style of leaf tattoo is that of the Celtic knot as it can be designed to look like many different things creating the leaf. 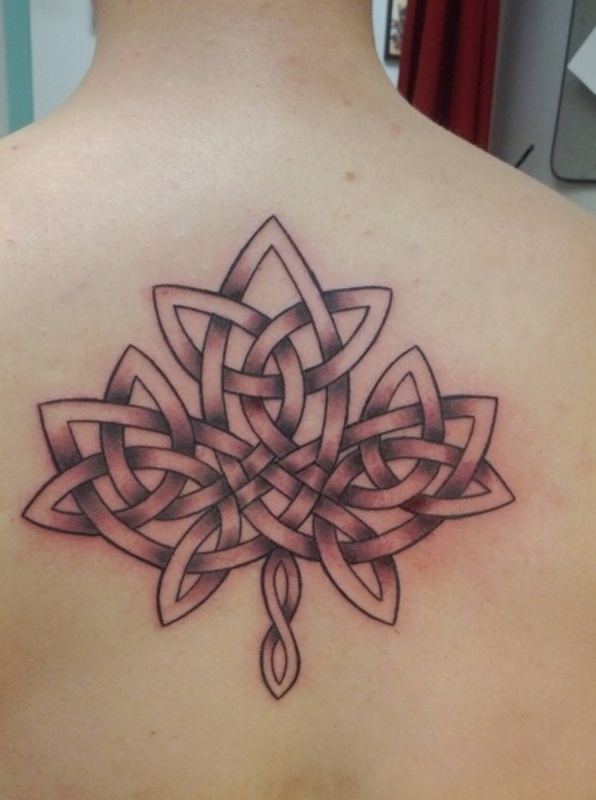 Keep in mind that if you choose a Celtic knot tattoo that you should ask the artist if they have done them before as the designs can get quickly confusing and cause mistakes to occur. 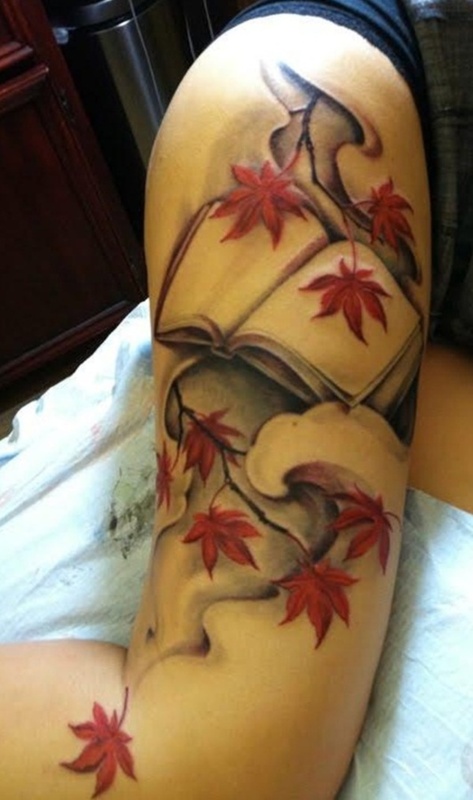 Combining two different loves into a single tattoo can make your artwork look more unique and personalized such as this book and silver maple leaves. Perhaps reading beneath the branches of a silver maple was this persons happy place and where they chose to spend their free time. 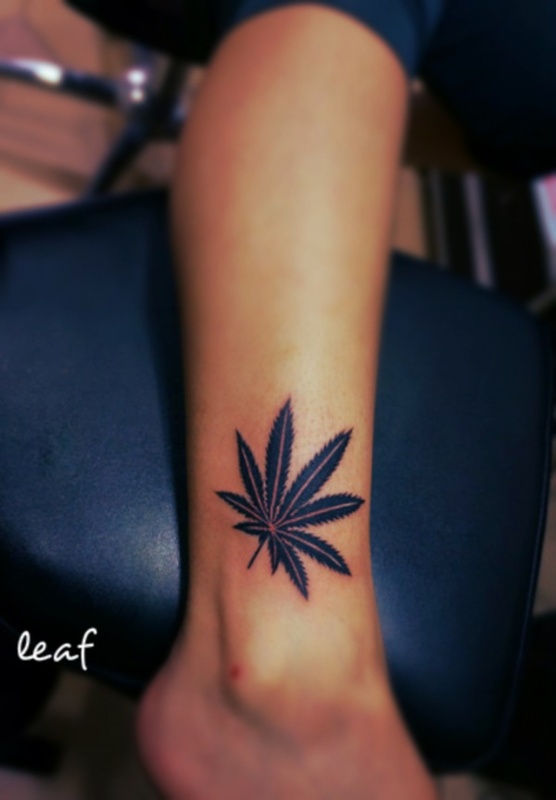 Designs of leaf tattoos are numerous as they can be bent into just about any form such as the marijuana leaf bent into a peace sign. 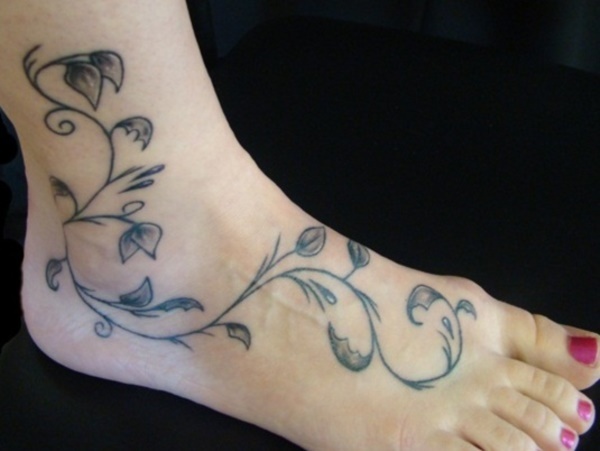 As mentioned before, vines can be placed just about anywhere including the ankle and top of the foot. Voluminous leaves such as these are incredibly feminine and contour the body in a way that follows the shape of the body’s natural curves. 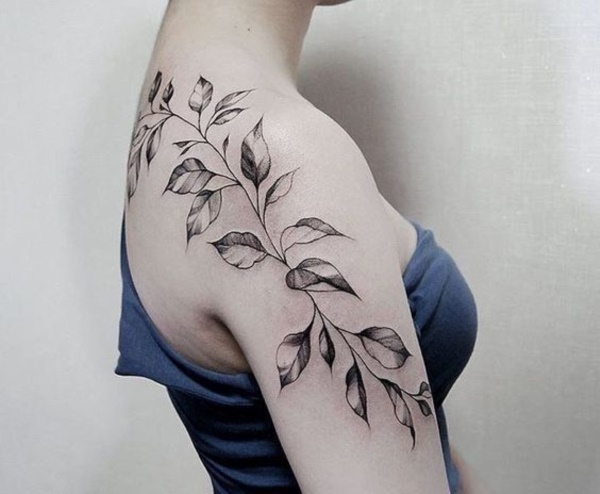 Fleur styled leaves are incredibly artistic and can be used as borders or a singular design that is both unique and simple. 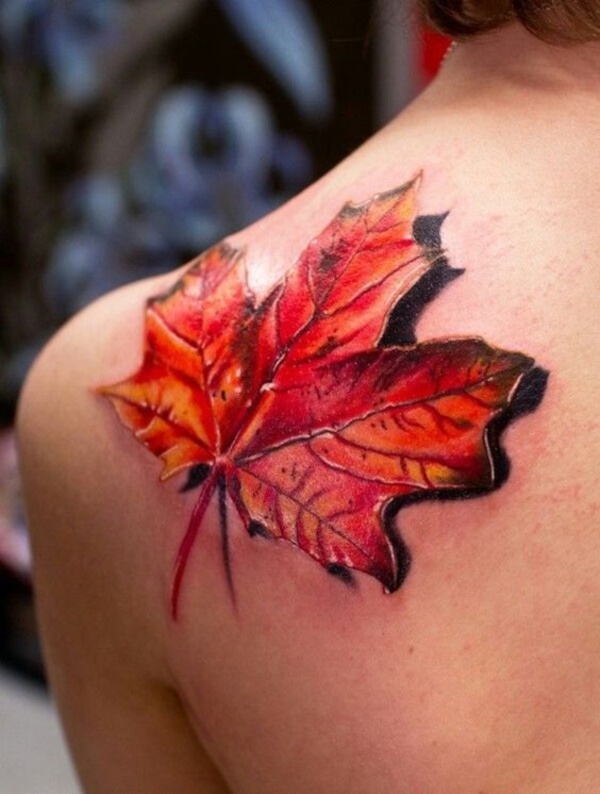 Here is a beautiful example of a leaf being used as a symbol of national pride as this maple leaf is colored much like the Canadian flag. Some choose to have a branch of leaves and many times they are olive branches or some other favorited tree. 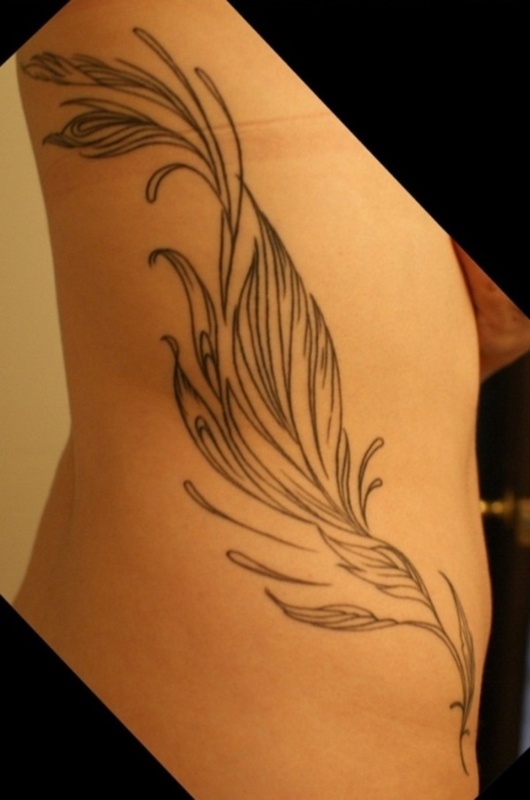 Tattoos provide you with an amazing opportunity to design your leaf tattoo in a way that represents you such as these leaves in the wind. 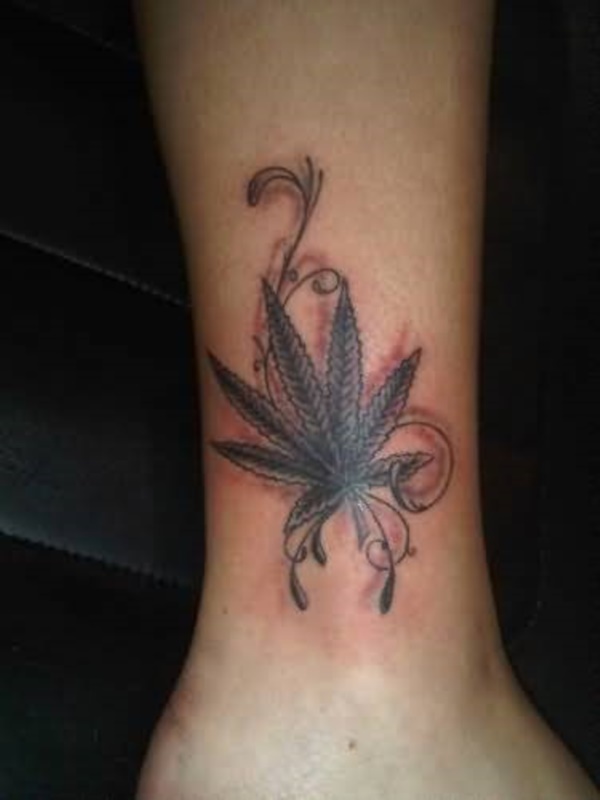 While this particular marijuana leaf is a bit more feminine as the swirling lines and leaves behind it provide a more delicate feeling, the shading and fill are done beautifully. 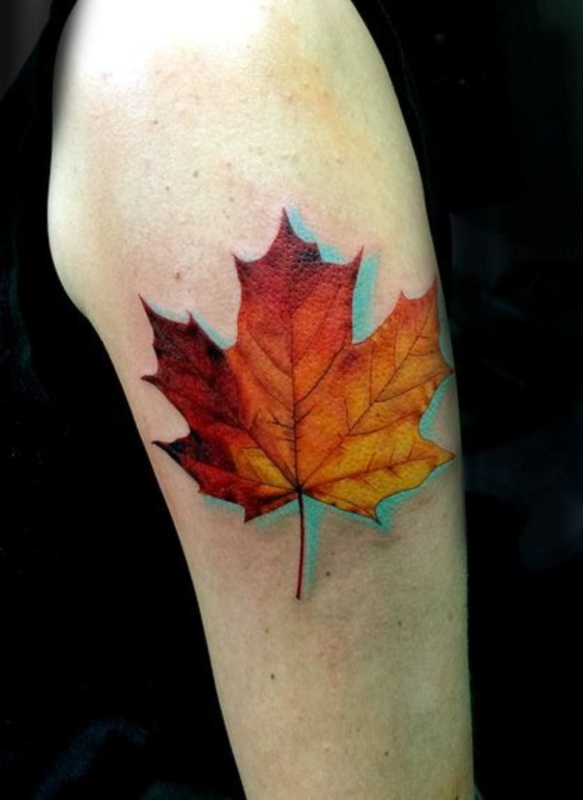 This brightly colored maple leaf provides bright colors that allow it to stand out from the crowd of other maple leaf tattoos due to the unique red outline. 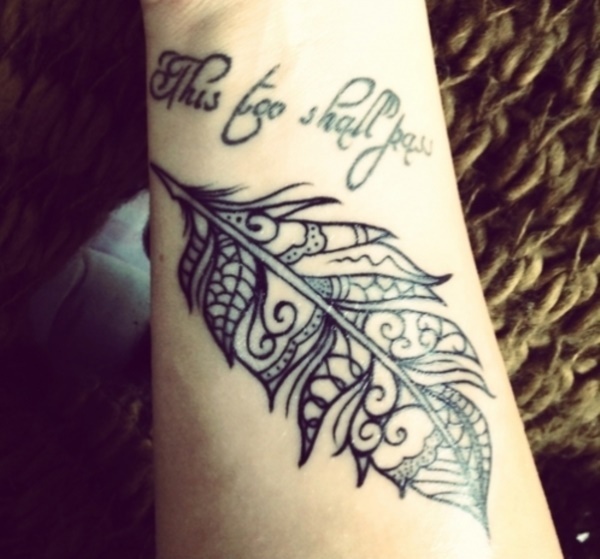 Whether this is a feather or a leaf is hard to tell due to the variety of patterns, however, the meaning remains the same that both drift away in the wind over time. 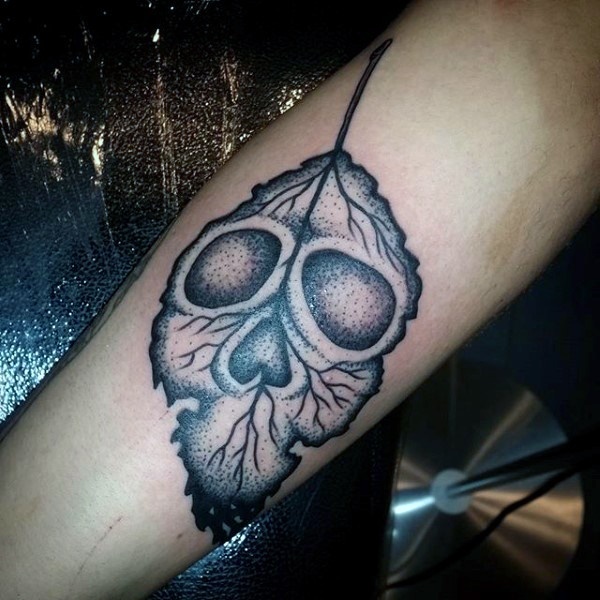 When leaves fall from the trees they usually have a little color left in them during the fall months however as time passes the leaves turn brown as they decompose, leaving the meaning of this tattoo representing life and death. 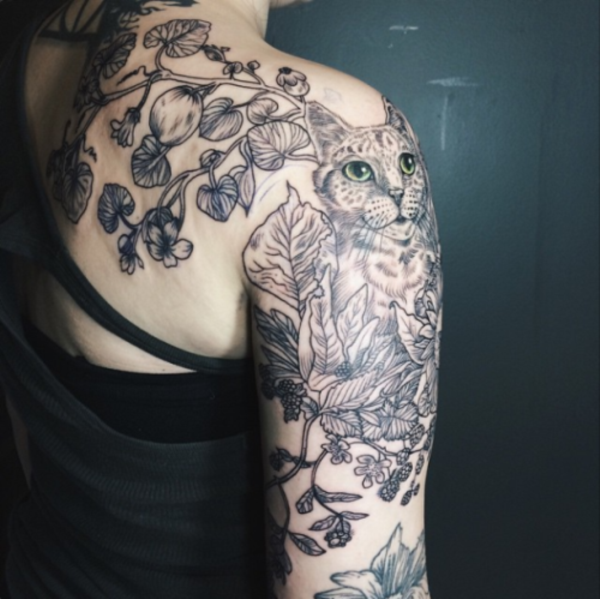 It’s difficult to tell what kind of tree or plant that this tattoo is, only that there is a cat among the leaves gazing through the beautiful line work of the tattoo. 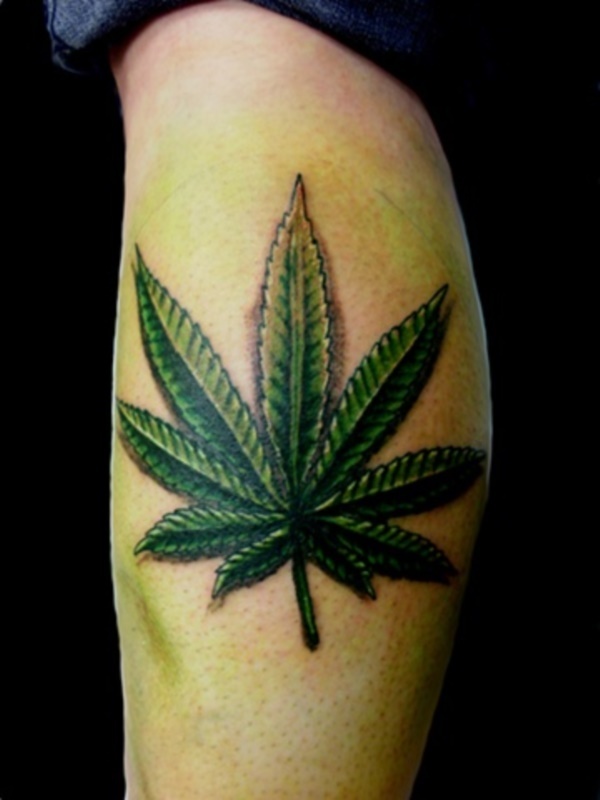 As the most popular leaf tattoo next to the maple leaf, this marijuana tattoo is brightly colored to make it stand out. 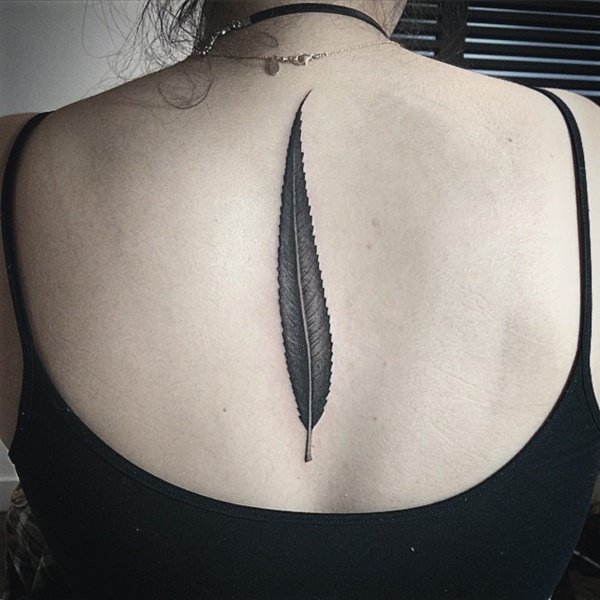 The placement of this long leaf tattoo along the spine not only contours the spine but is perfect for those who wish to possess a leaf tattoo that they can hide for work. 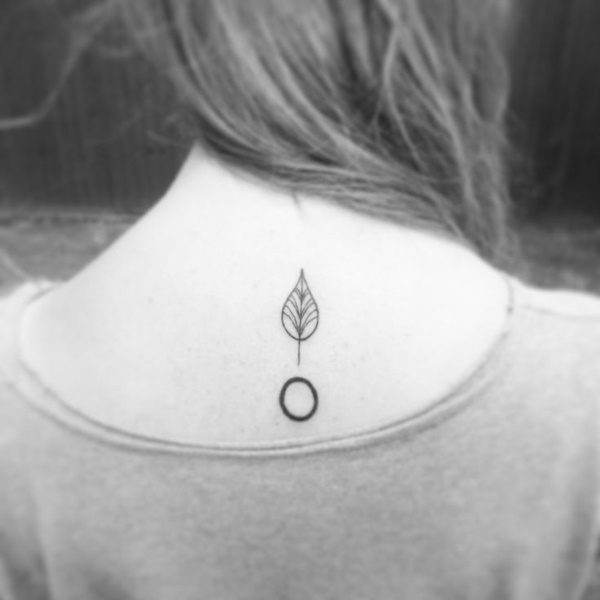 Since the cycle of life is incredibly apparent with trees as they lose their leaves in the fall and sprout new ones in the spring, it can only be assumed that this tattoo is symbolic of this cycle. 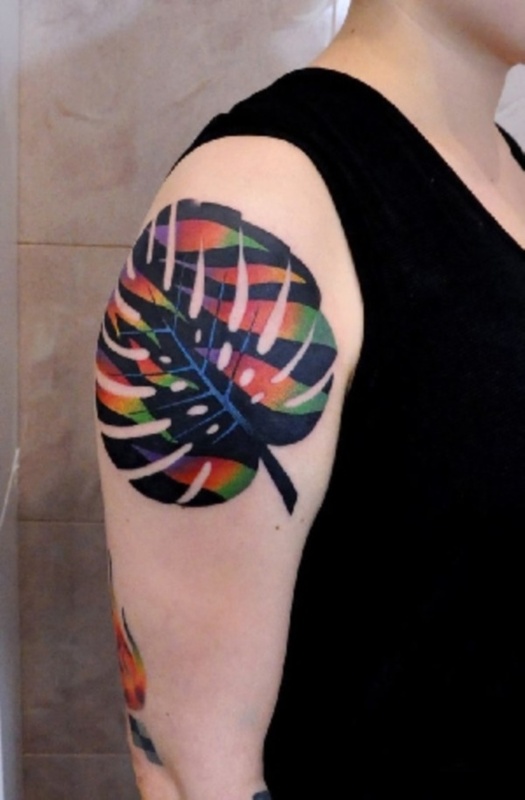 This tattoo is rather whimsical and while only the wearer will be able to explain its meaning it is a beautiful work of art consisting of three amazing elements. 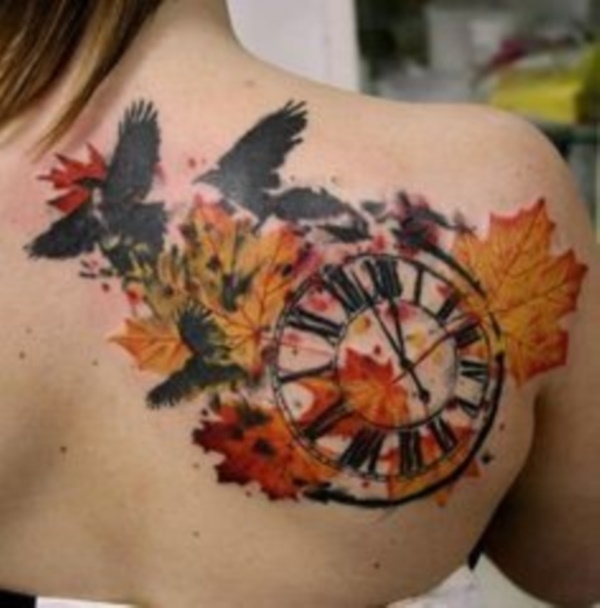 It is entirely possible that the clock represents time while the leaves represent the cycle of life and the crows symbolizes how fast time really does fly by. 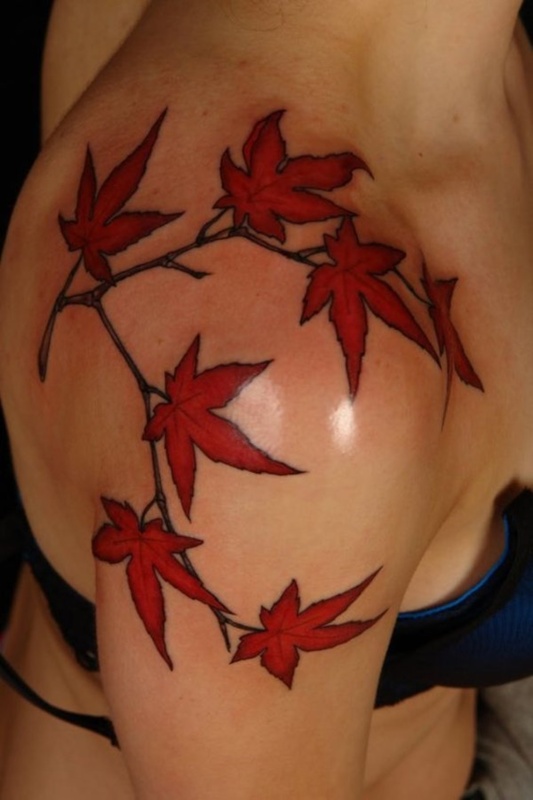 These bright red leaves either belong to a silver maple which has perpetually red leaves or that of a maple in the fall, however, it is perfectly situated on the shoulder creating an amazing line with its placement. Whether the numbers are a date or simply a year that is to be remembered, the pair of oak leaves look amazing and are another wonderful leaf to choose. 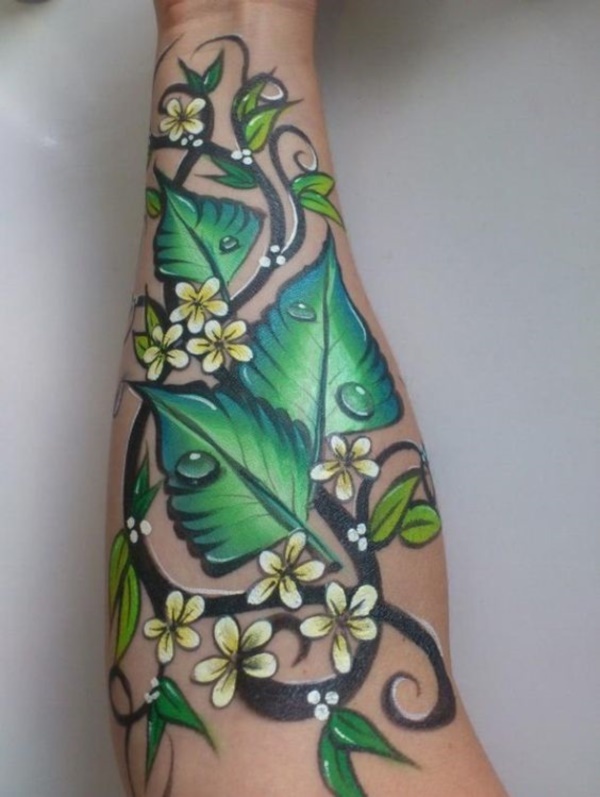 You may have noticed that branches are very common and can create an amazing sleeve for nature lovers. Sometimes choosing just a single leaf or tree can be difficult, however, that shouldn’t stop you from getting at least one of each of your favorite elements or leaves from nature. 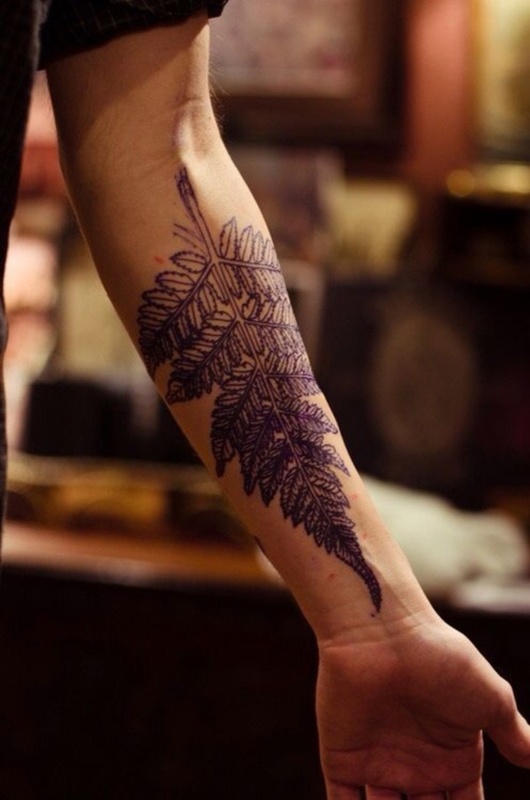 While this was done in a singular color, this fern tattoo appears to have a watercolor style to it creating a flowing work of art. The combination of oak and maple leaves may be significant to the wearer, but to those who don’t know the reason for the individual’s choice, the balance of the leaves between the sharp points of the maples and the rounded edges of the oaks create an interesting balance. 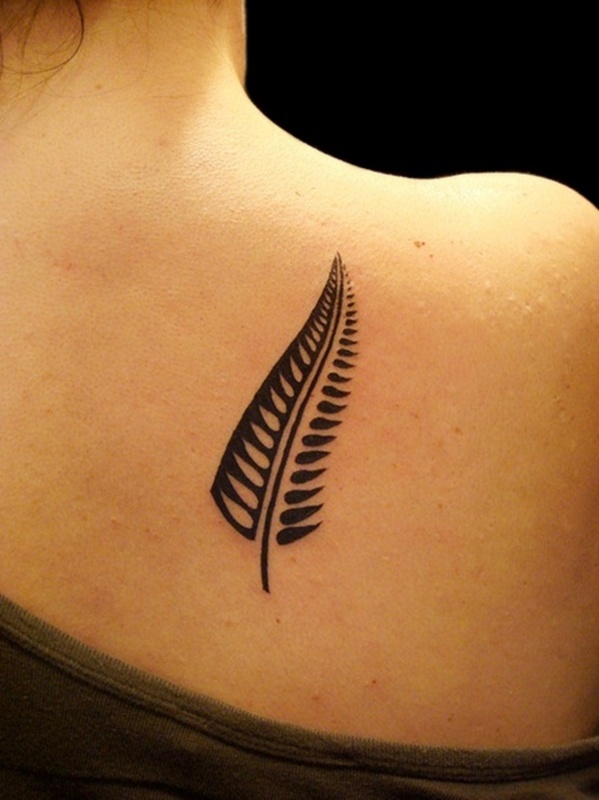 Fern tattoos don’t have to be large or filled, but can be done in all black depending on the appearance you want. 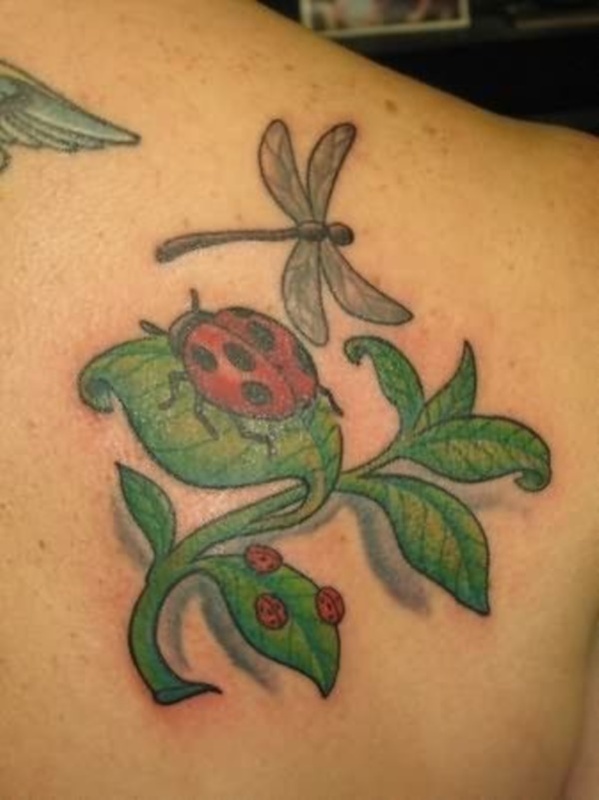 The ladybugs may seem like the stars of this tattoo, however, they only seem to make the leaves they are sitting upon stand out that much more. 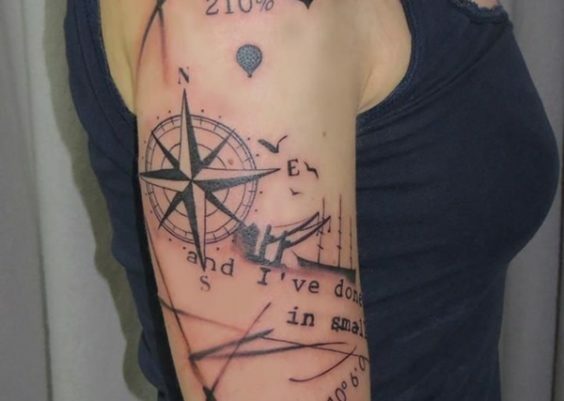 While this tattoo is obviously not simple, it does have a wide variety of possibilities for interpretation and is visually beautiful. 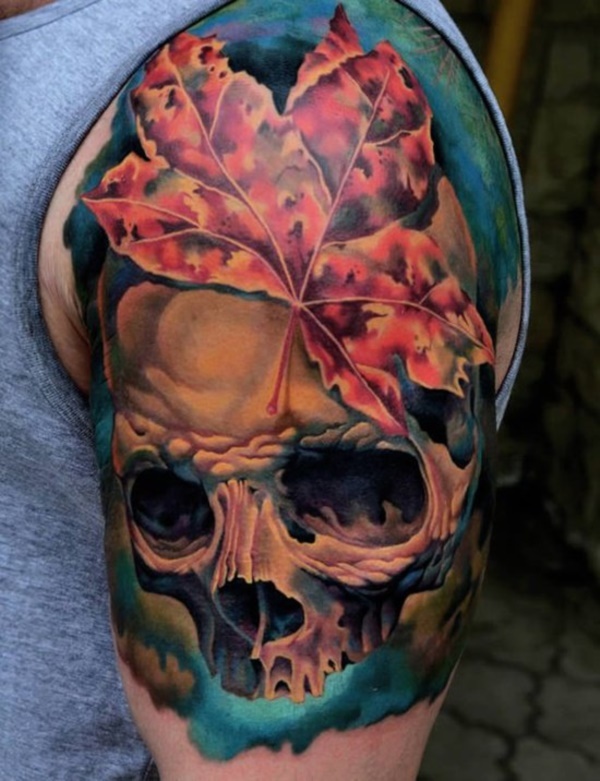 Since skulls are an incredibly masculine element you can always add a gruesome skull to any leaf design to make it seem more masculine. 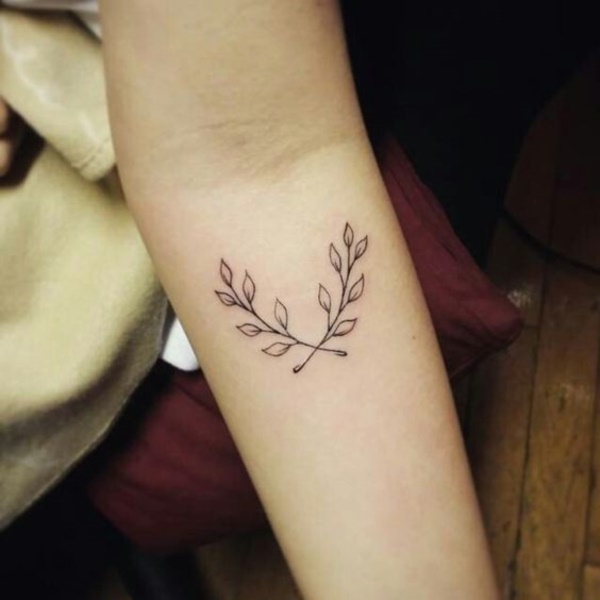 These small olive branches carry a great deal of meaning including that of peace and various other meanings that have been tied to them through stories and history. 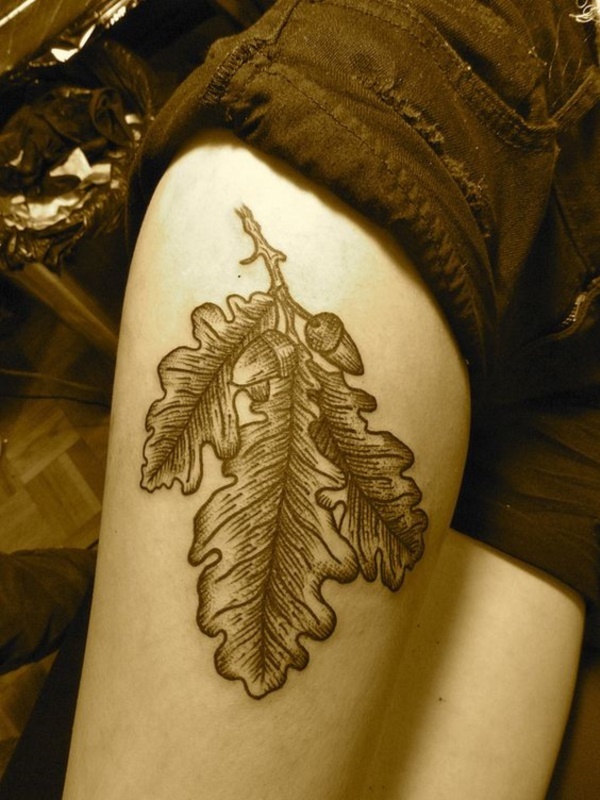 Everyone knows that oak trees grow acorns, so it is only fitting that this oak leaf tattoo possesses a couple of acorns among the leaves. 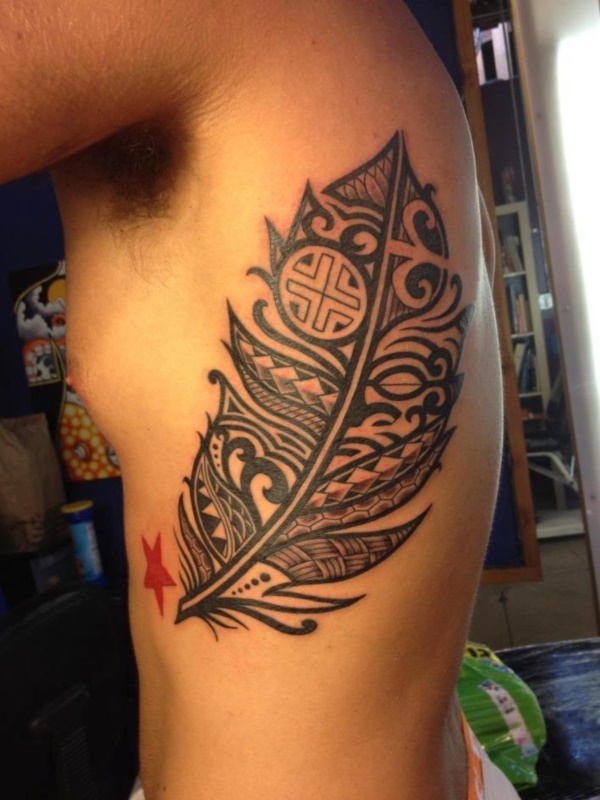 By adding other things to your tattoo you are giving it more life and creating something different. While these leaves appear to be piled upon this person’s shoulder, you can also see the leaves that have drifted away and are standing out from the group. You could almost believe that the meaning behind this work is to not be afraid to stand apart from the crowd. 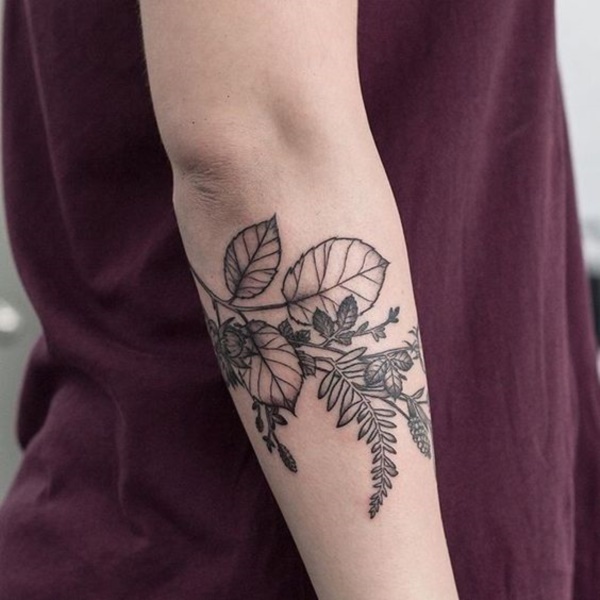 Vines with flowers are another awesome choice for those who love leaf tattoos and nature since they offer a feminine touch to the overall look of the tattoo. 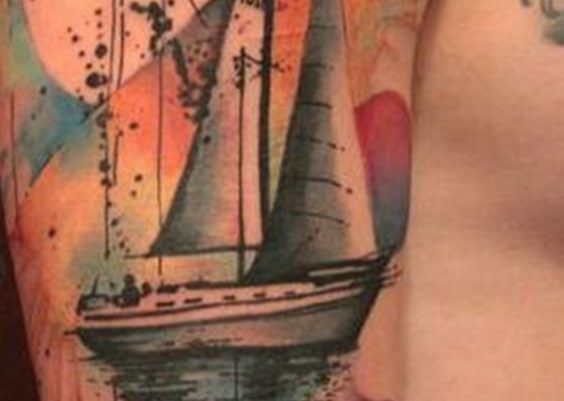 While this tattoo appears to have been painted on, it possesses a great deal of color that provides a beautiful character to the work. 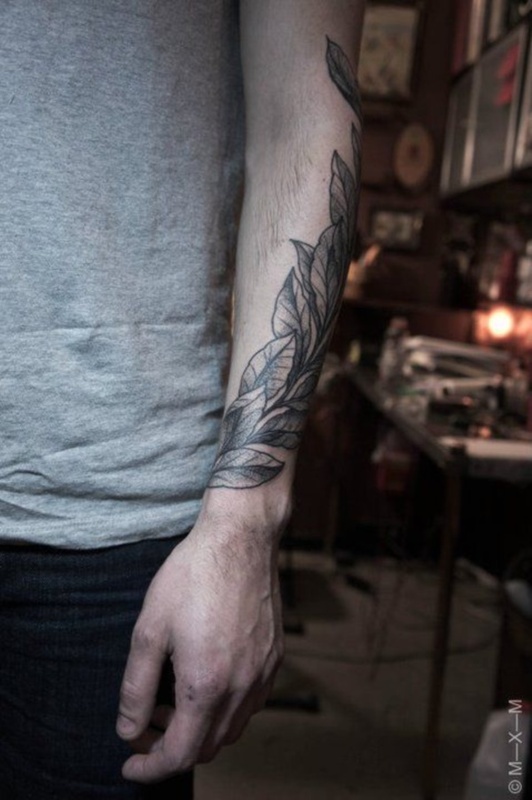 Leaf tattoos don’t have to be in a specific spot as they can fit anywhere on the body depending on the size and since they can be done in a simple manner you can simply receive an outline of the leaves. 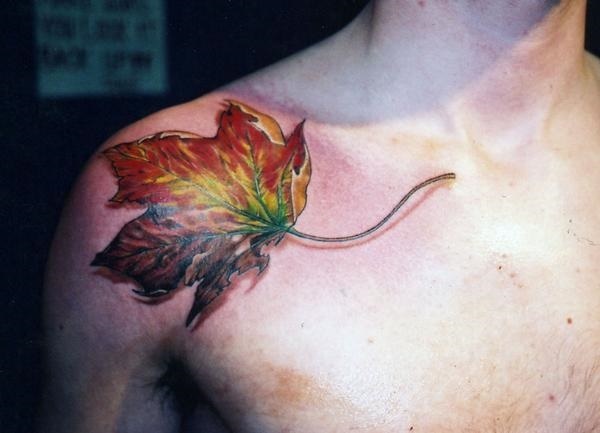 While this kind of design isn’t seen very often, you can get a unique leaf tattoo by choosing to get your leaf in a state of decay or as though it has been eaten like the tattoo below. As you can see this particular leaf appears to have been snacked on by a caterpillar. 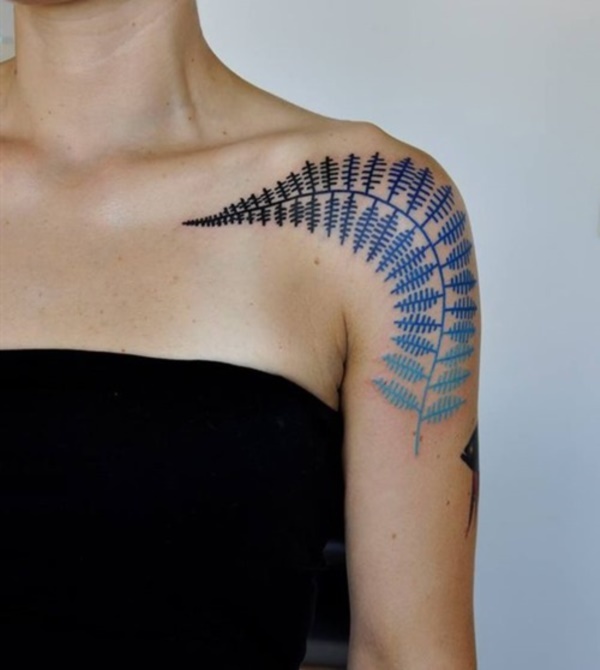 Nobody said your leaf tattoo has to be a specific color, as you can be creative with each tattoo that you receive, and like the fern below you can even have your artist create your work in something like a beautiful blue. 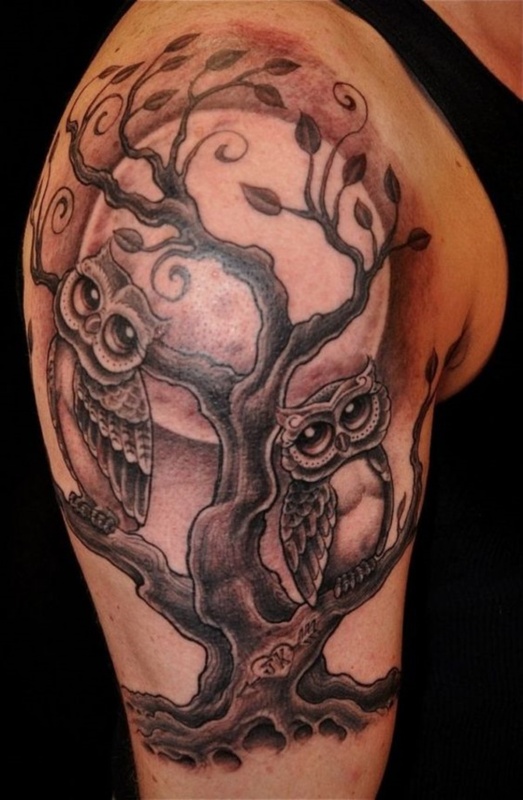 The leaves of your tattoo don’t have to be the center point for your tattoo like the tattoo of a pair of owls, although the tree does have a few leaves on the branches. 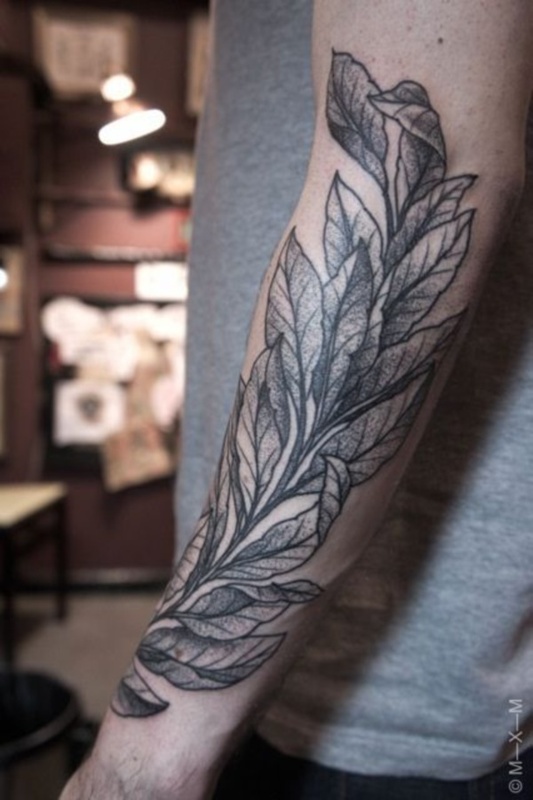 Sleeves created from branches of leaves can provide you with something a little different from the norm and allow you to show off your favorite type of tree as well as your passion for nature. 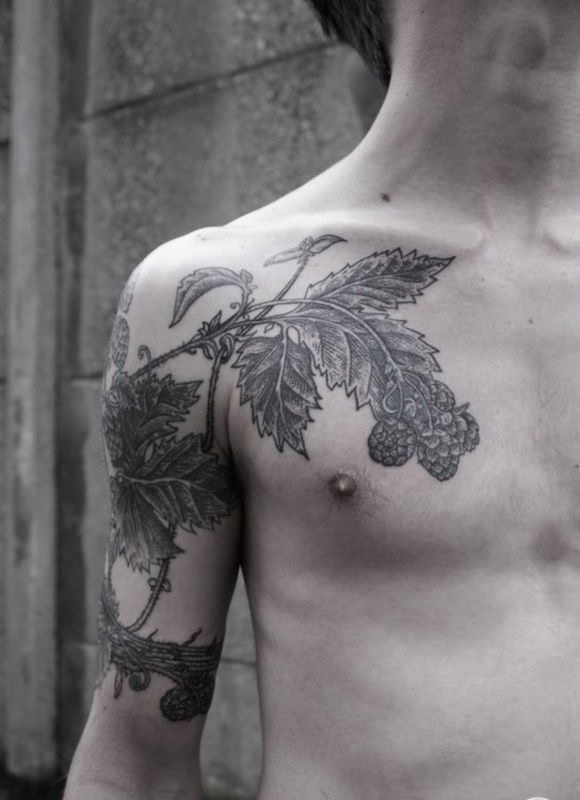 Sometimes your leaf tattoo can also be a symbol of luck such as a four-leaf clover which has been seen as lucky for many decades. This not only allows you to express yourself but enjoy one of the rarer clovers out there. 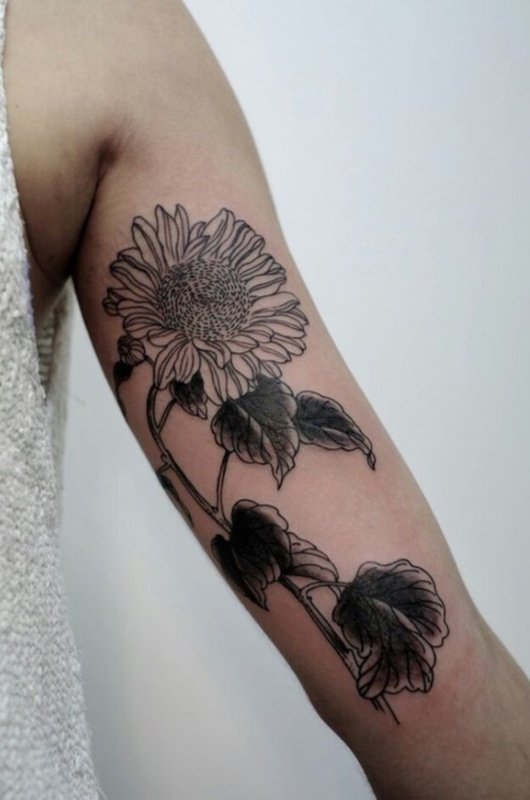 Floral tattoos are incredibly popular and come in a variety of styles including the most realistic variety like the one seen below. 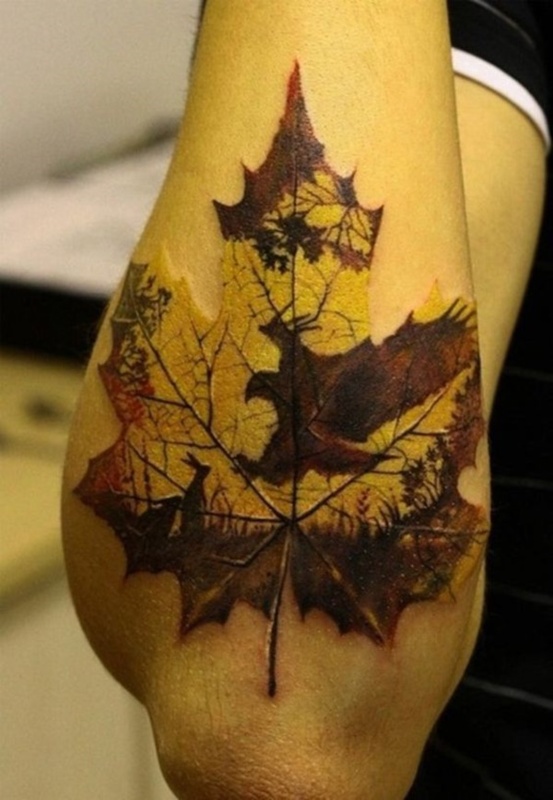 While some may not see this as a leaf tattoo, it does grow in nature which is what qualifies it for our list. 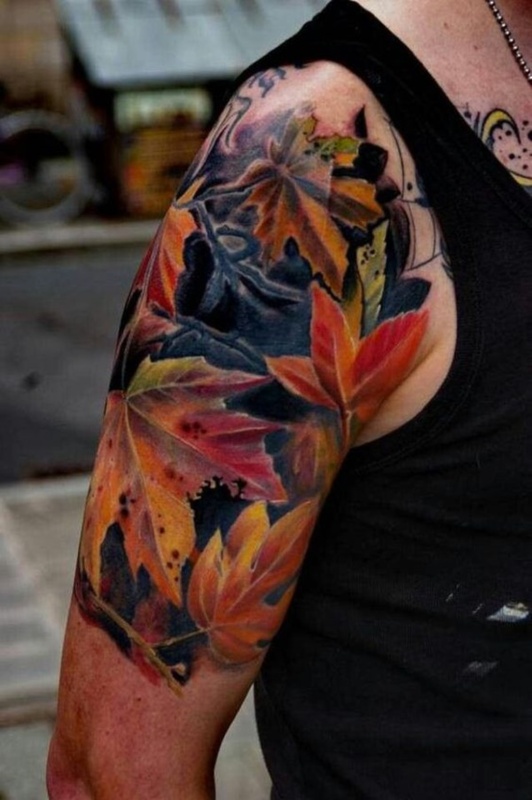 Leaves that are done in a more realistic style may cost a bit more money to have done, however, they look amazing once they have been completed and can be considered worth the money from the right artist. 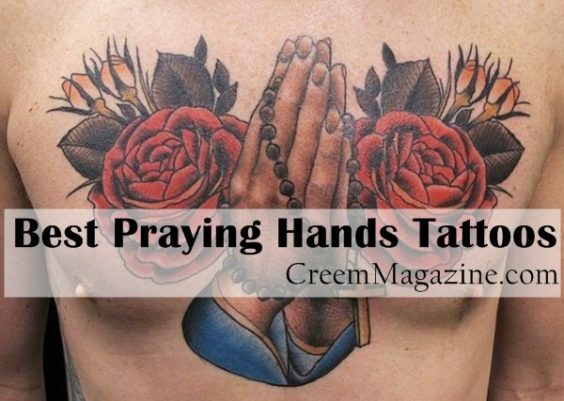 Some people choose to have tattoos on their hands while others prefer the wrist, but if you find that you cannot choose between the two then why not get both. 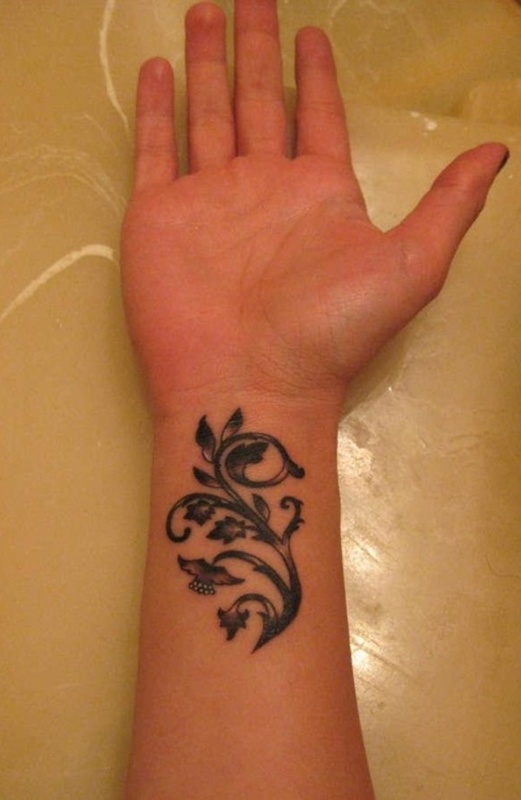 This leaf tattoo appears to be that of an olive branch and looks amazing placed between the wrist and hand. 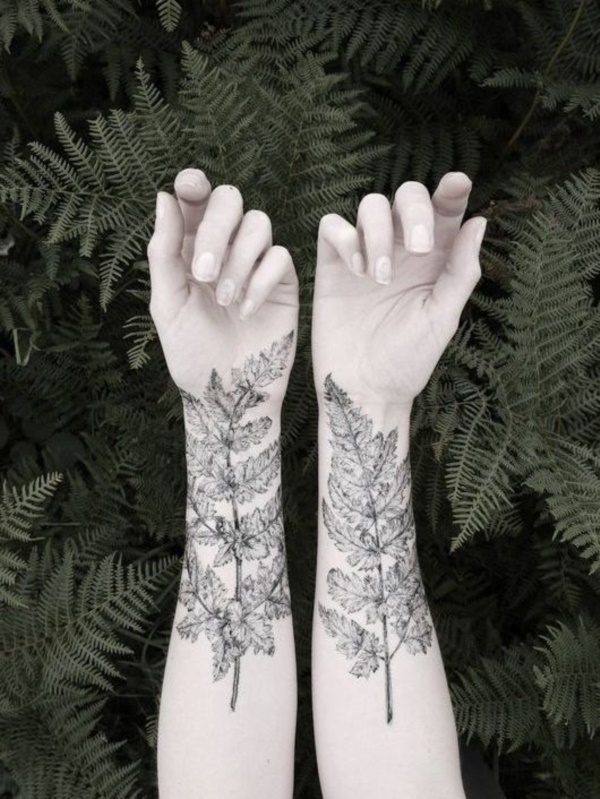 If you love symmetry then you may want to consider getting a matching set of leaf tattoos on either your wrists or legs like these beautiful fern tattoos. While they aren’t identical, which no plant ever is, they do match and suit each other like sisters rather than twins. Have you ever seen a leaf that has fallen and decomposed everything except the veins? 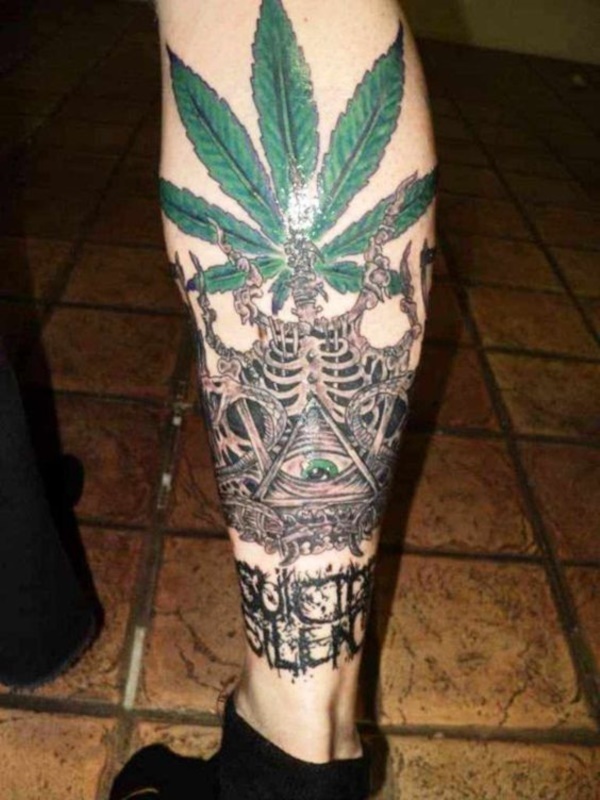 Not only are these leaves interesting but can carry a heavy meaning behind them that most people may not consider. 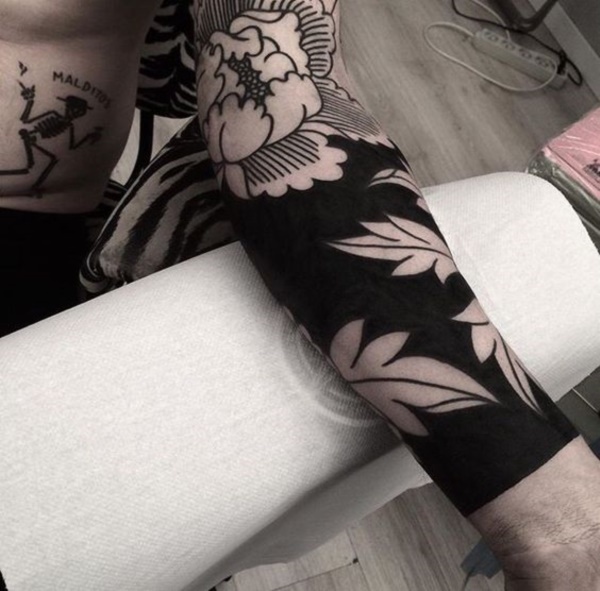 It is unclear what kind of plant this tattoo is, however, the level of detail in the leaves and flowers is amazing considering its size. Sometimes the smallest tattoos tend to come out the best when the artist truly cares about their work. 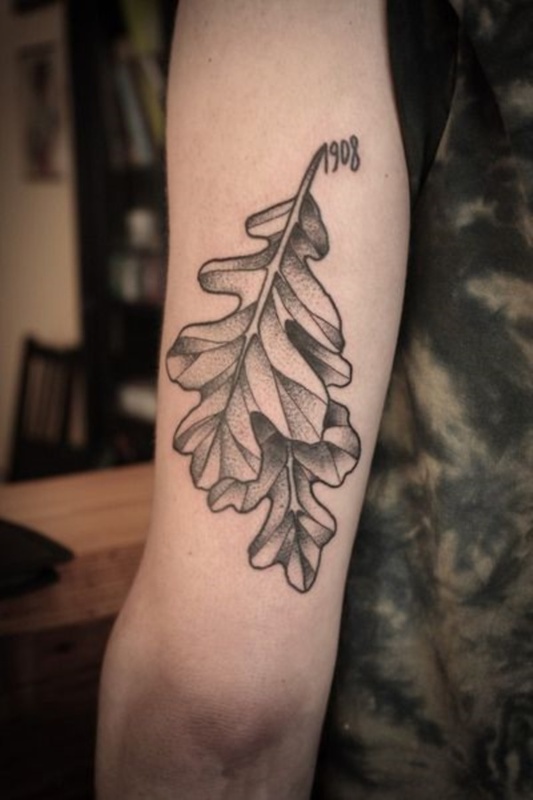 There are thousands of various plants and trees to choose from as you search for your own leaf tattoo designs. You may find yourself going through the meaning of each plant or tree to choose one that has a specific meaning or you can simply find one that means something special to you. One of the greatest things about getting a tattoo is that it should mean something to you personally and not what it means to everyone else. 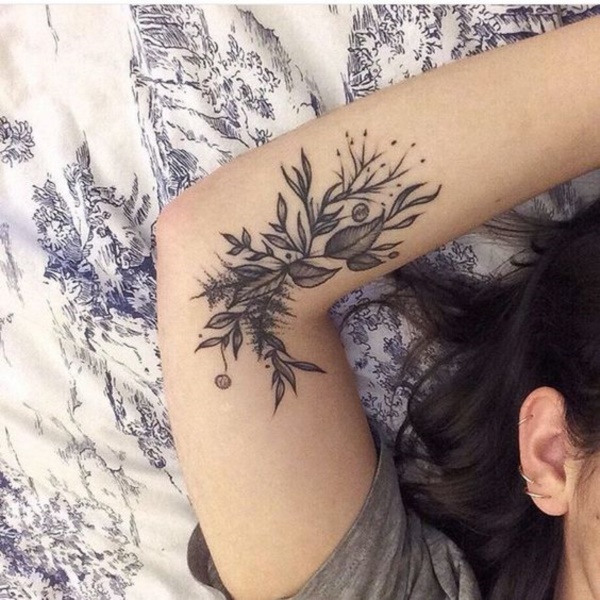 The artwork that you choose to put on your body will forever be with you and can be incredibly difficult to cover, so ensure you are making your choice wisely.